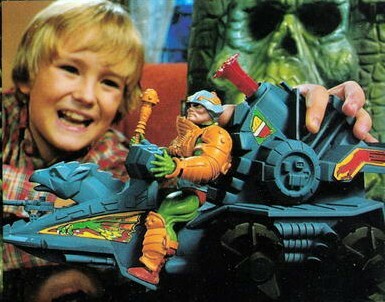 Great thoughts on a great toy. 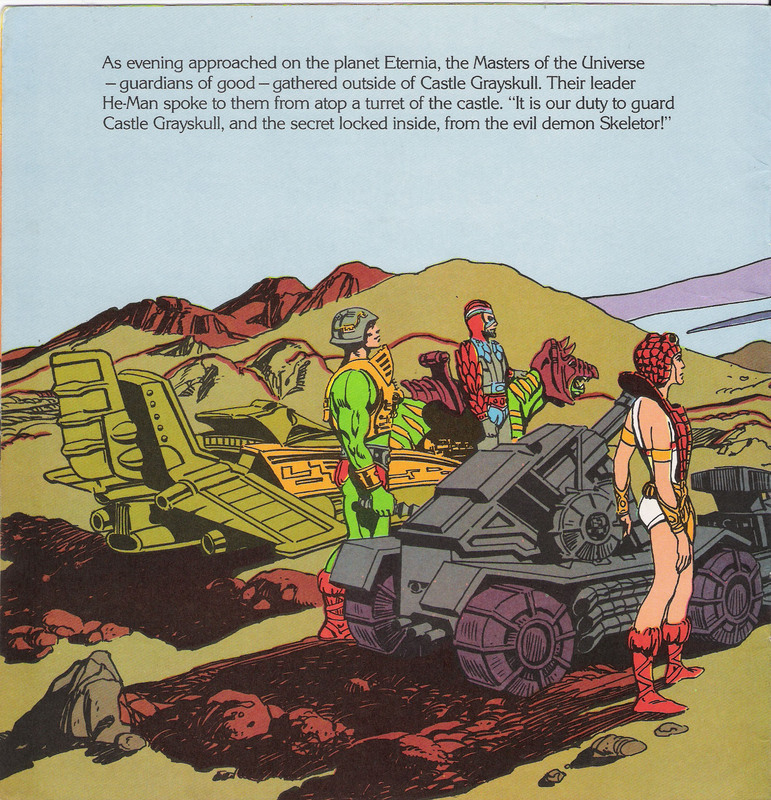 The “carries warriors through space and time” blurb really fired my imagination back when I first read it (not in the 80s, though – around 2002, when I got the re-issue box set that included some of the old minicomics). 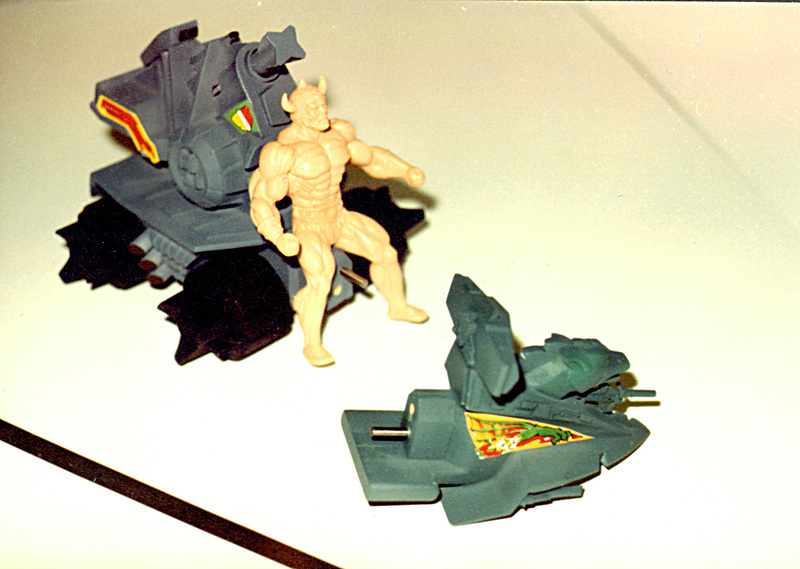 One thing you didn’t mention is how the missile-firing gimmick is ridiculously potent. 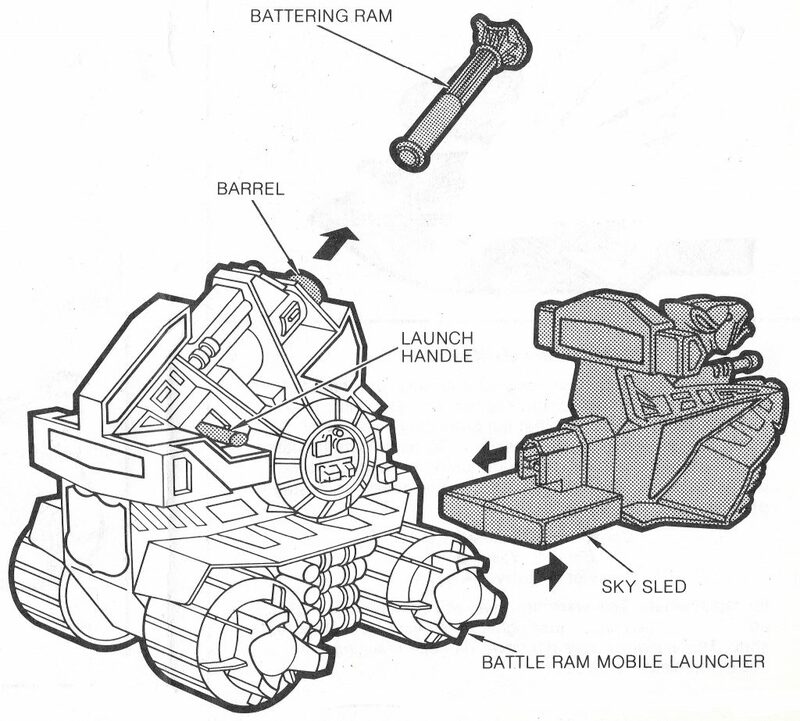 That thing will launch the projectile a solid 10-15 feet! 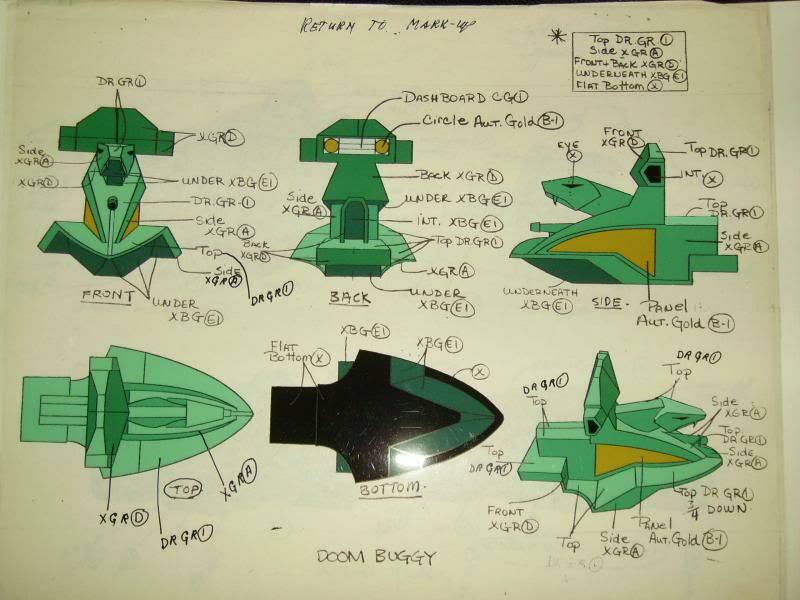 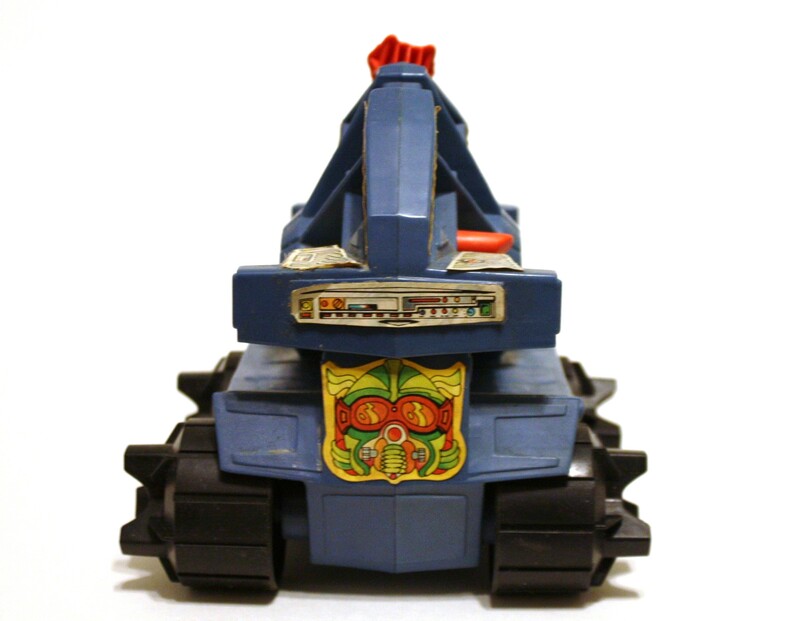 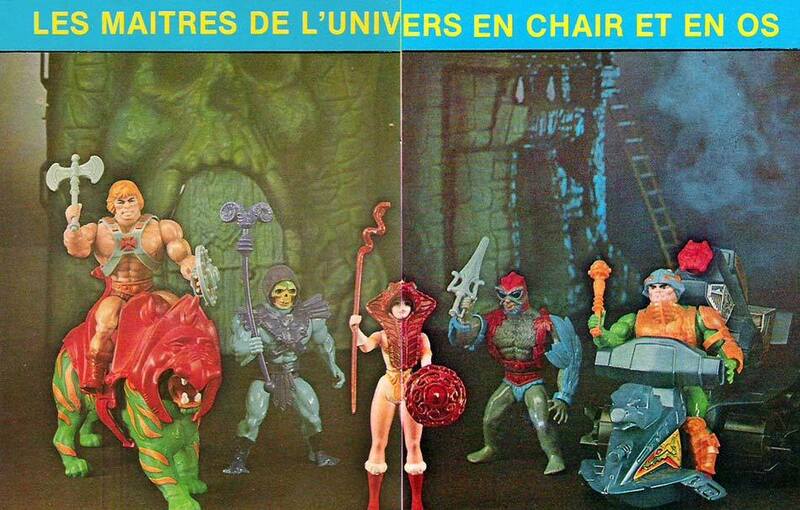 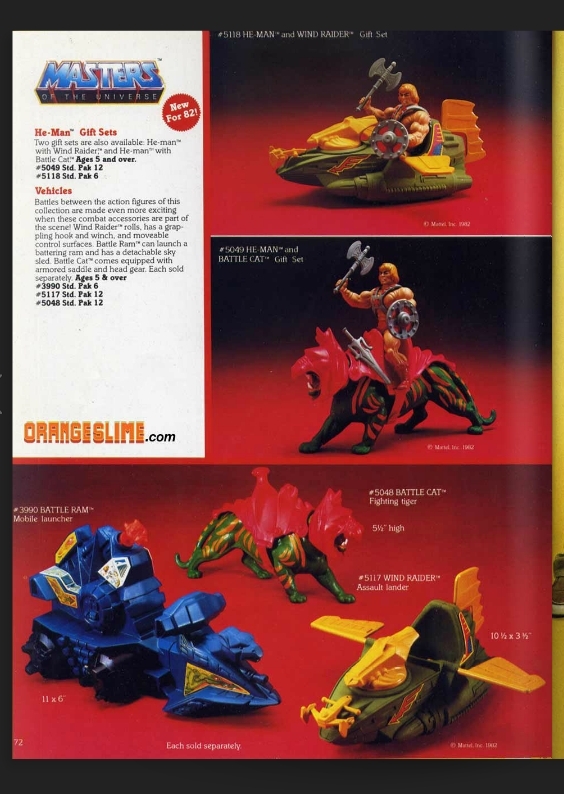 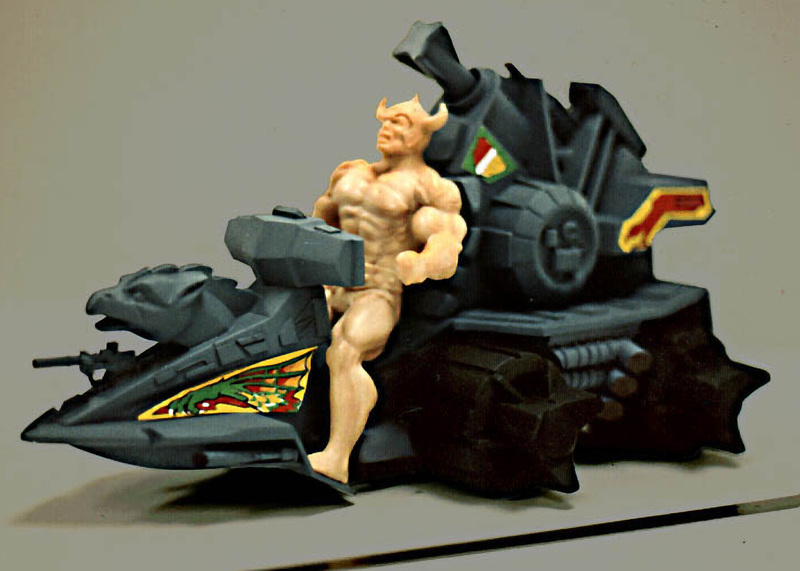 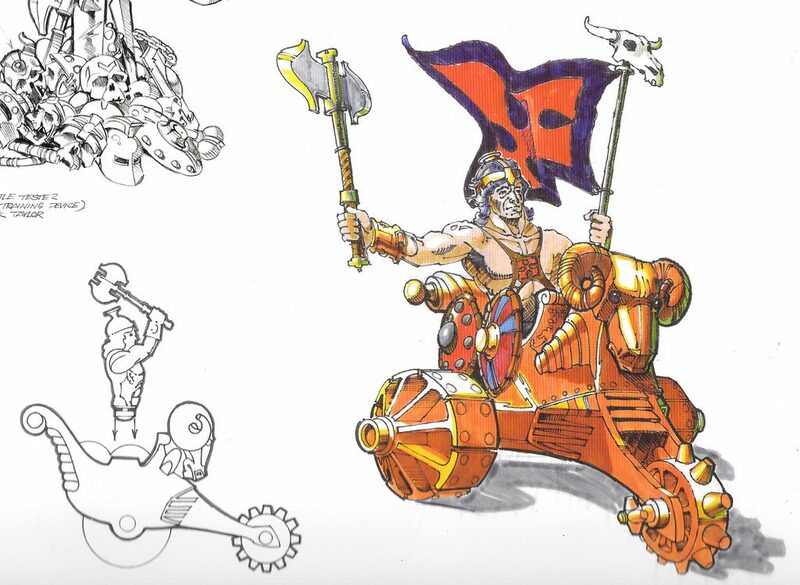 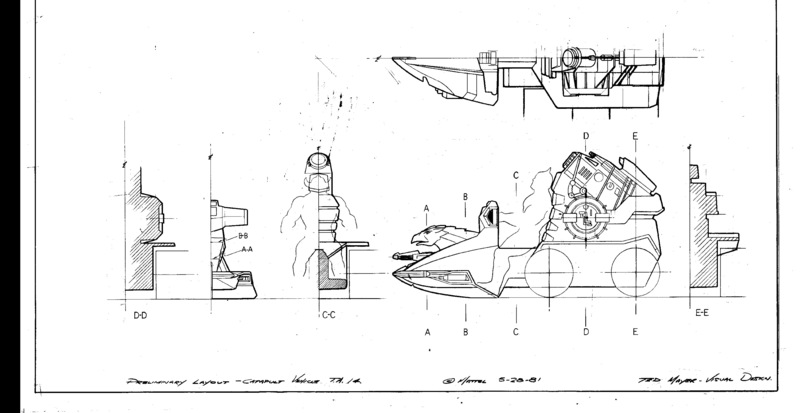 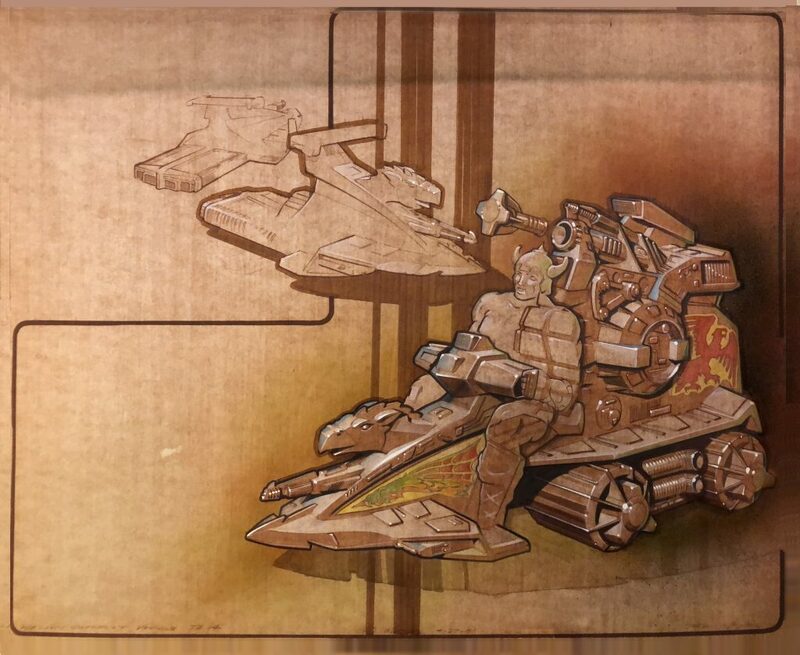 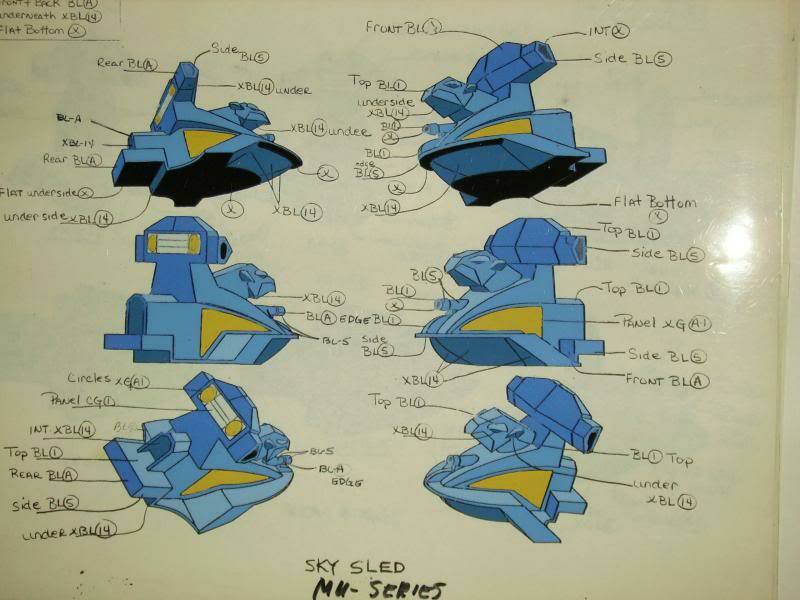 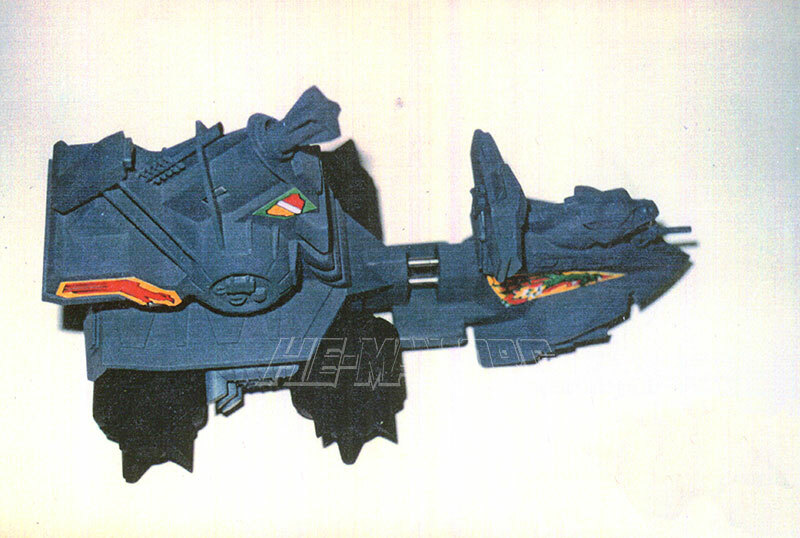 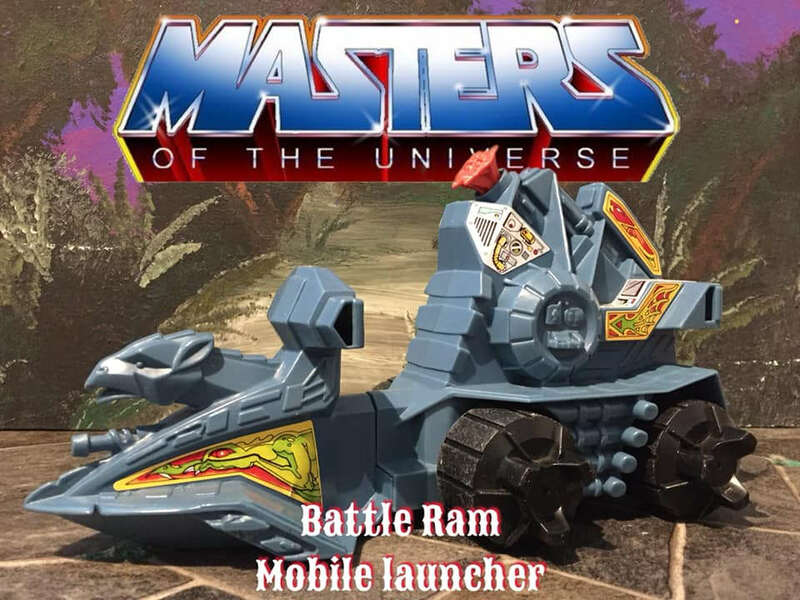 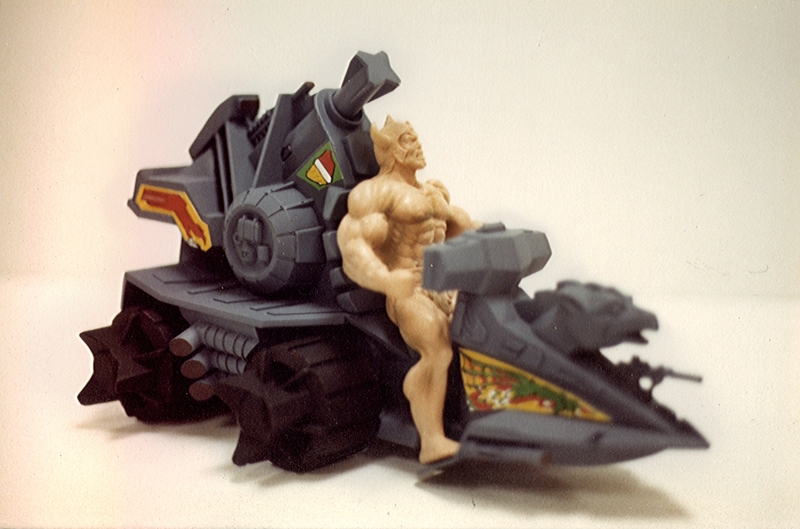 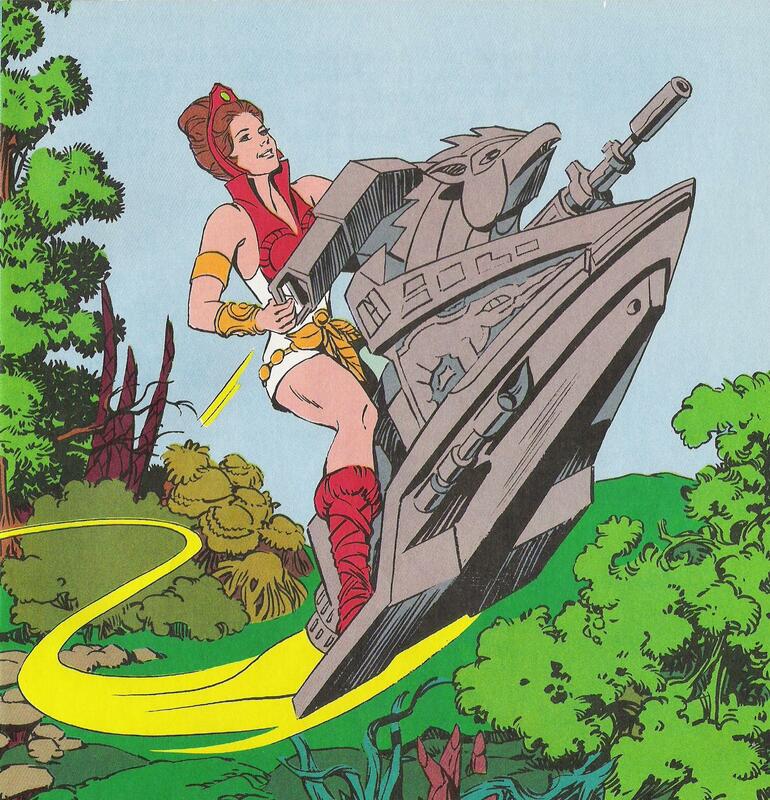 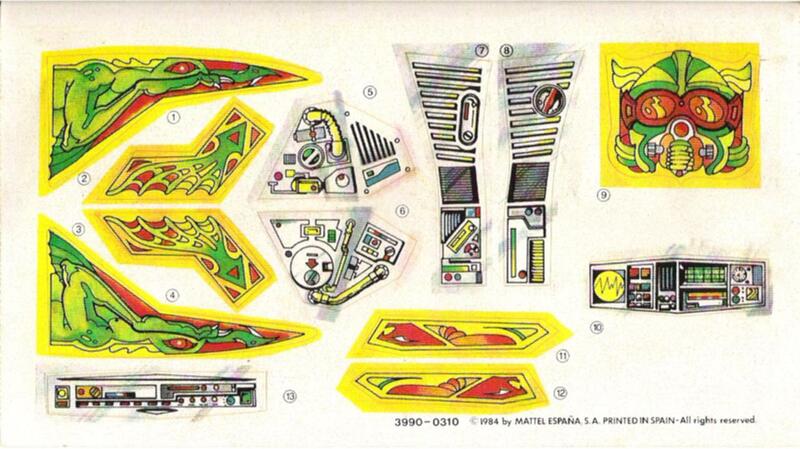 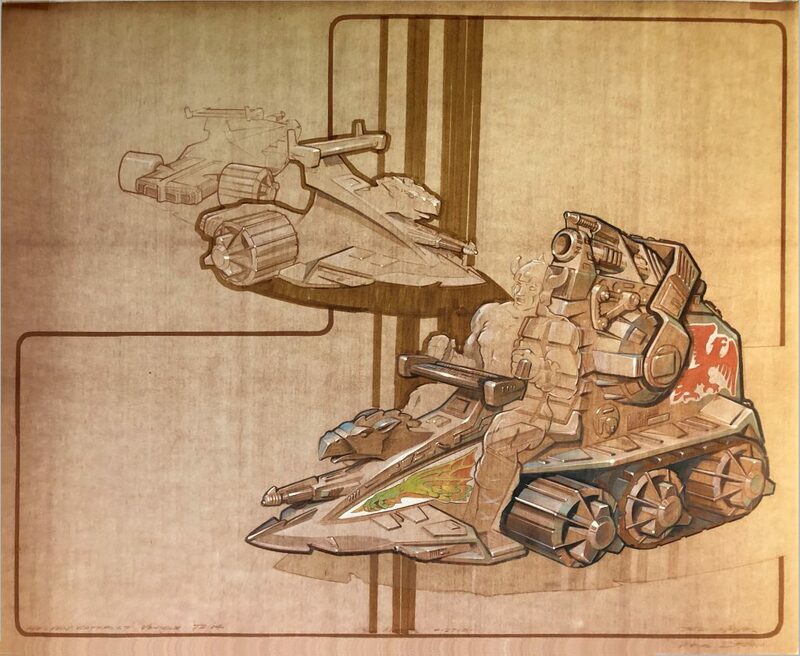 Interesting article as always on an interesting MOTU vehicle. 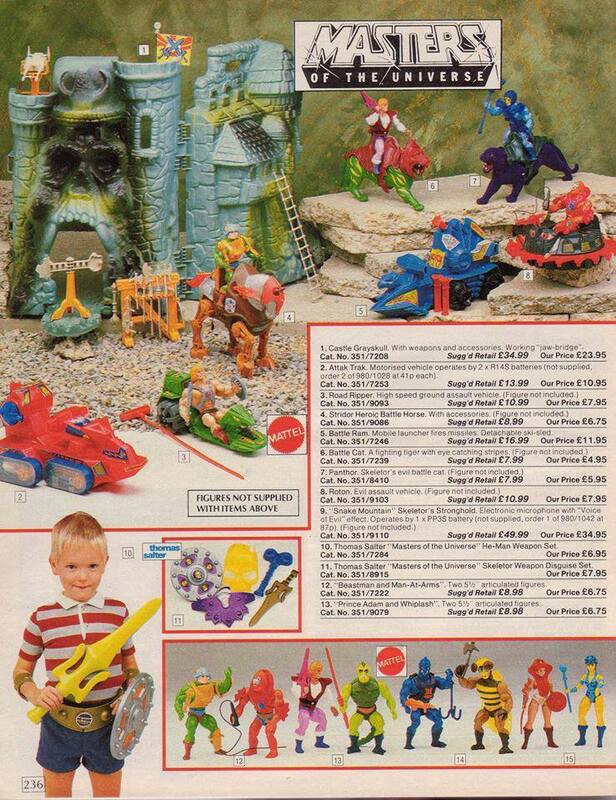 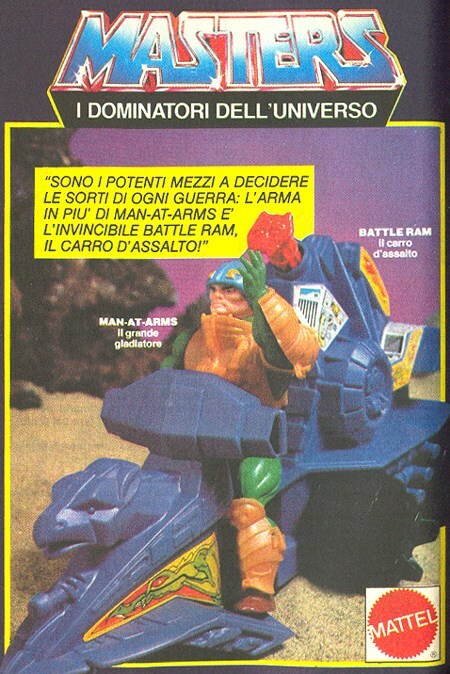 Although I was in MOTU pretty much from the start as a boy, by the time it hit the U.K. it was kinda the first two waves together, so I don’t think until I came to “re-collect” the line seriously from the late 1990s, that I’d realised Battle Ram was such an early release, literally one of the very first items released, even ahead of some of the key iconic characters. 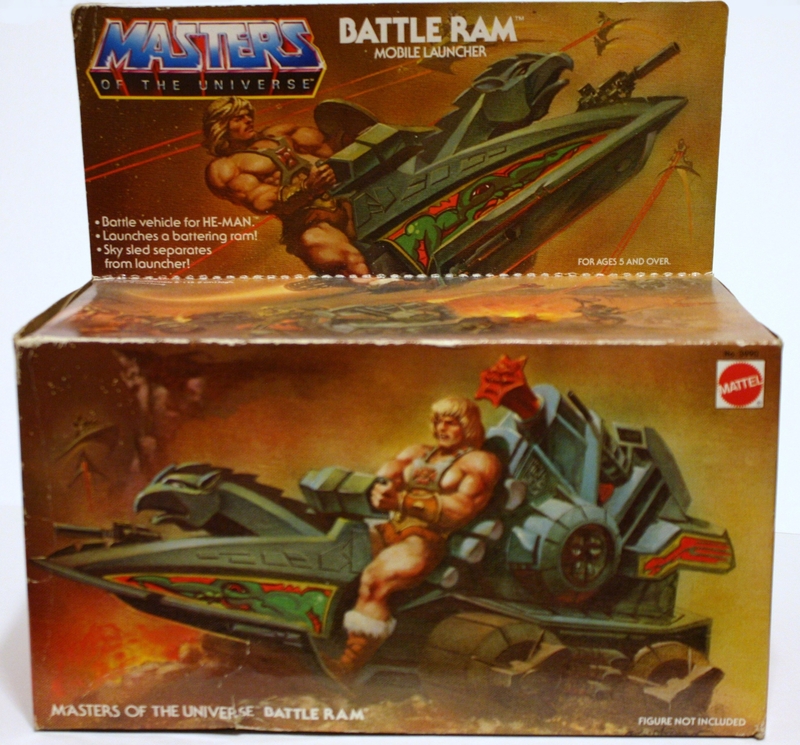 Either way, I never had a Battle Ram (on hindsight I never had many of the vehicles originally), nor did any of my friends that I can remember, so whilst I love it for what it is (I’m a sucker for anything from the first two waves), I haven’t got quite such a close affinity with it. 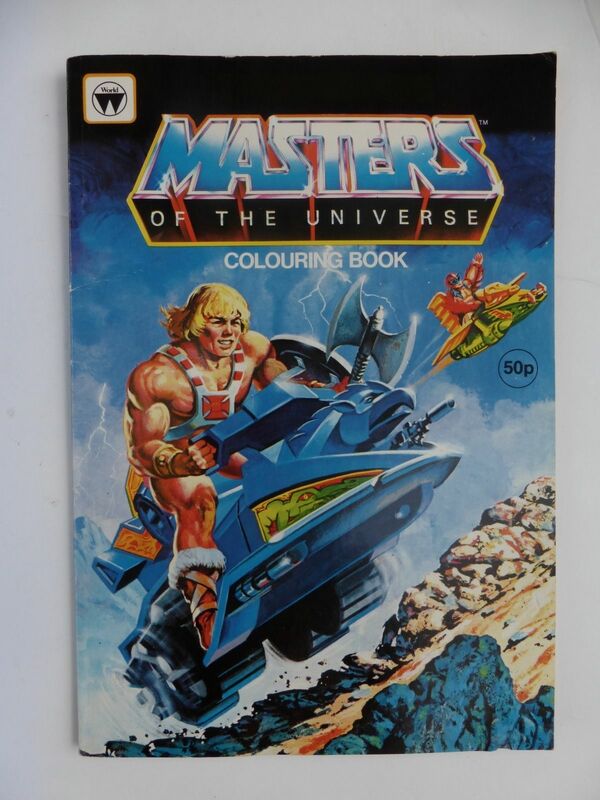 It certainly looks good, though when I did get one on the second-hand market, it never felt as “chunky” as I’d wanted, due to it being quite hollow. 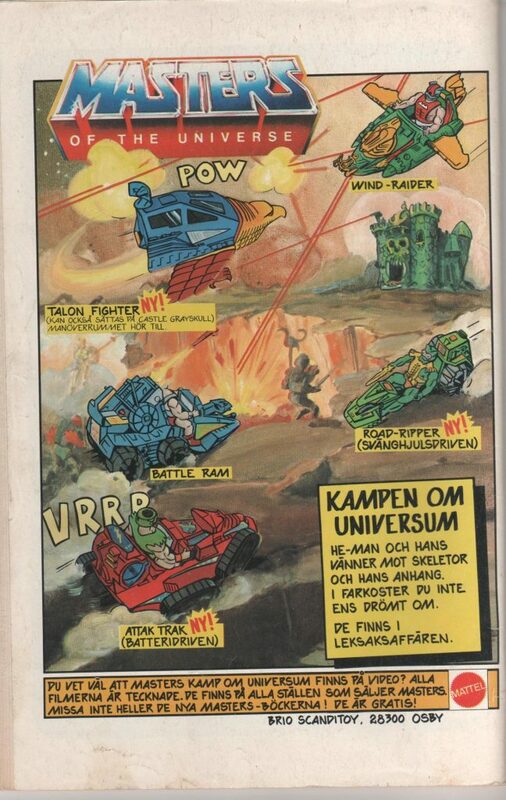 The early concept of it being able to teleport through space and time is intriguing, and was obviously dropped quite early one. 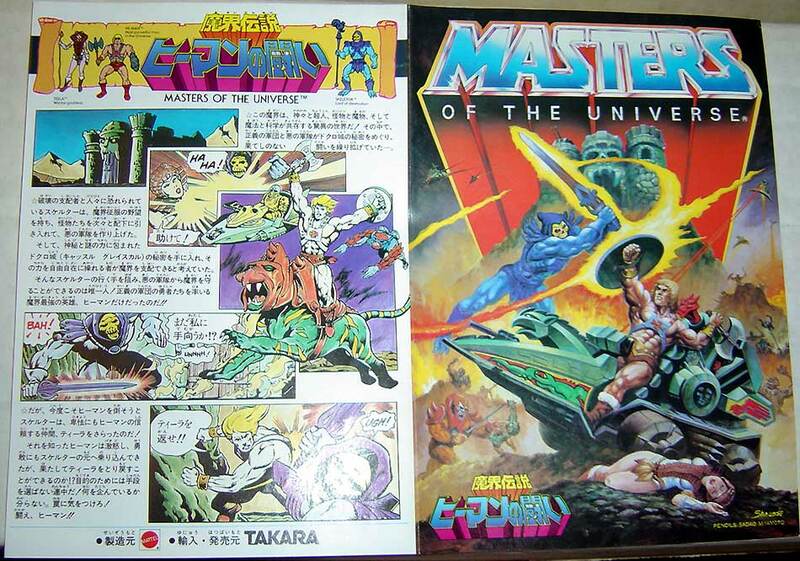 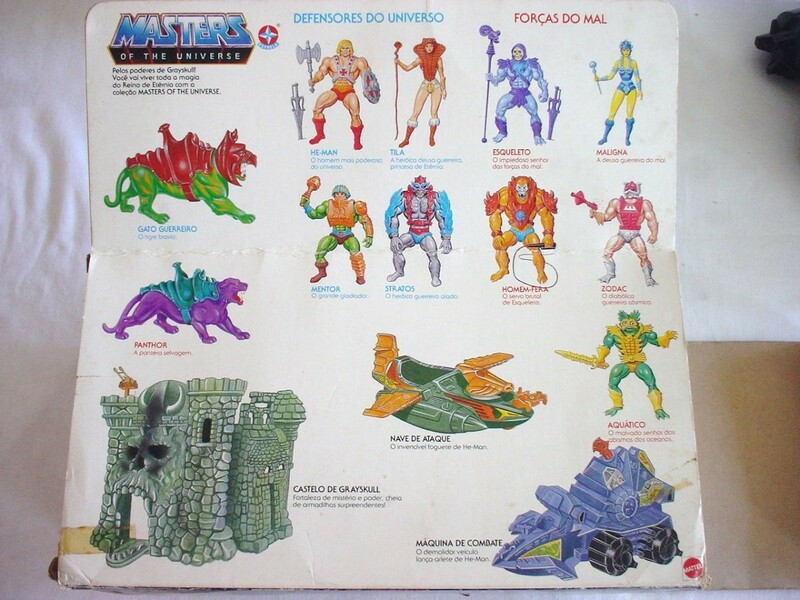 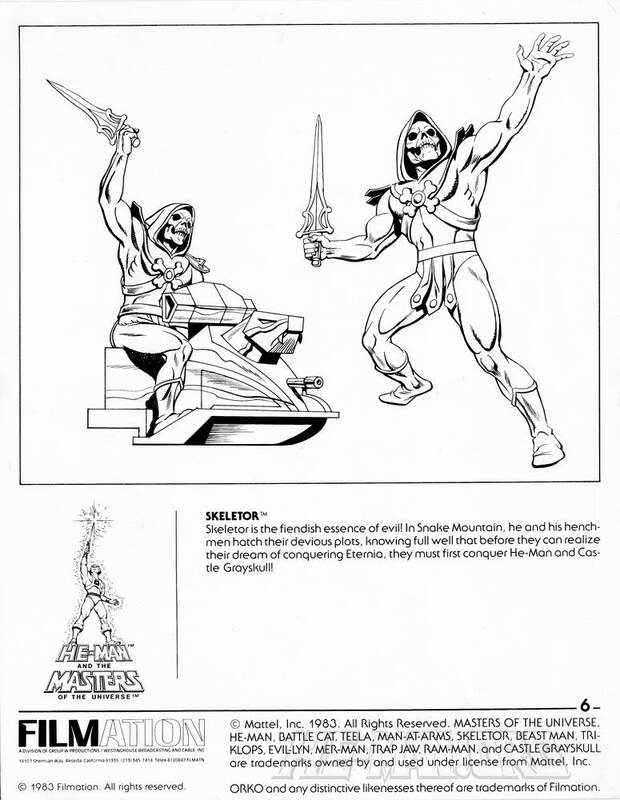 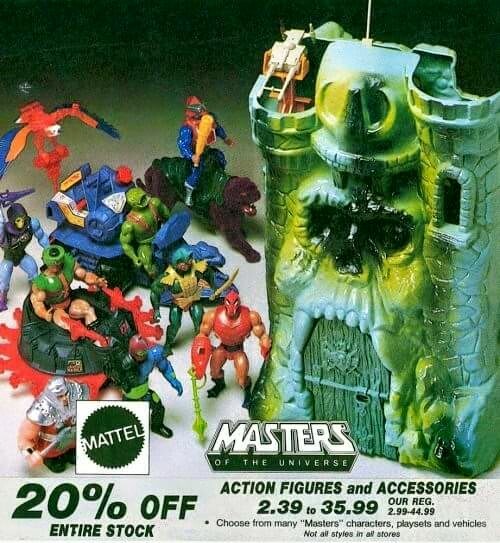 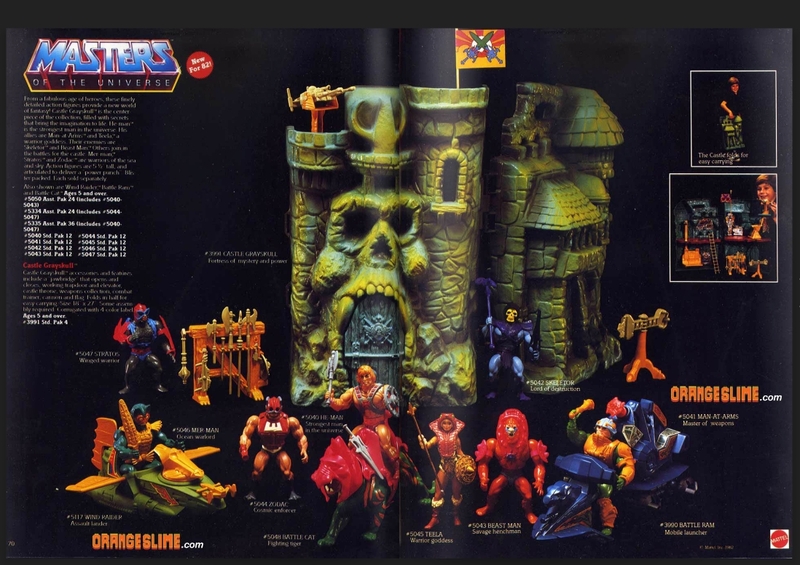 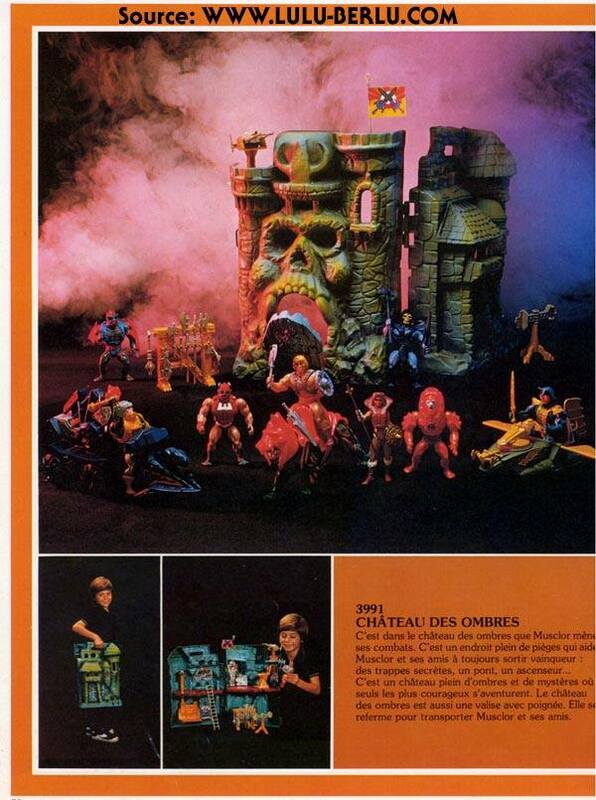 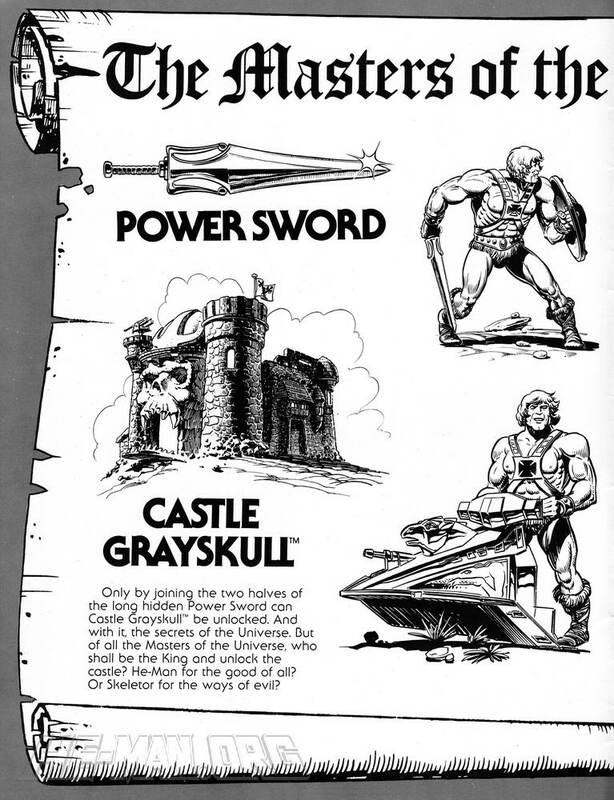 One the very first mini-comic even mentions it; it seems to tie in with some of the early ideas for the line, such as a very early, pre-release concept that Castle Grayskull could likewise teleport and whoever was in control of the castle controlled this power (another take on ‘Master(s) of the Universe’). 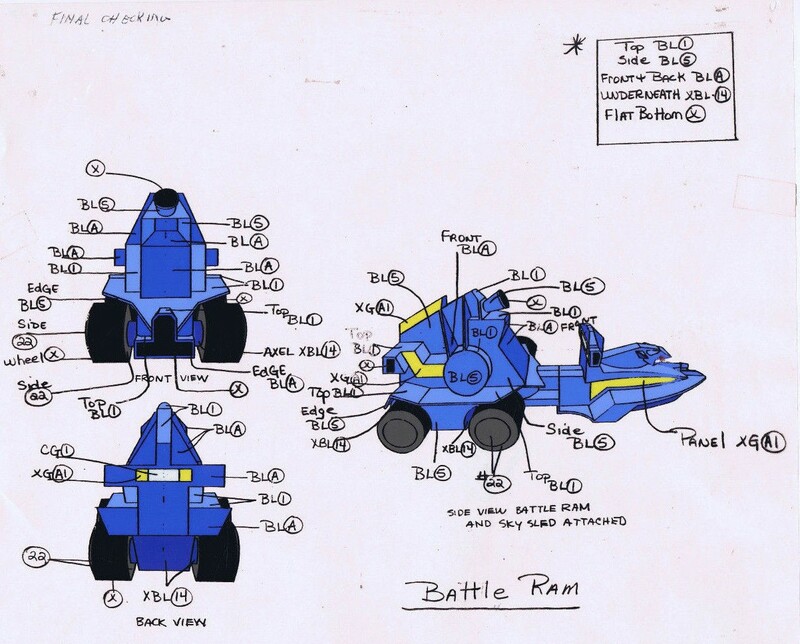 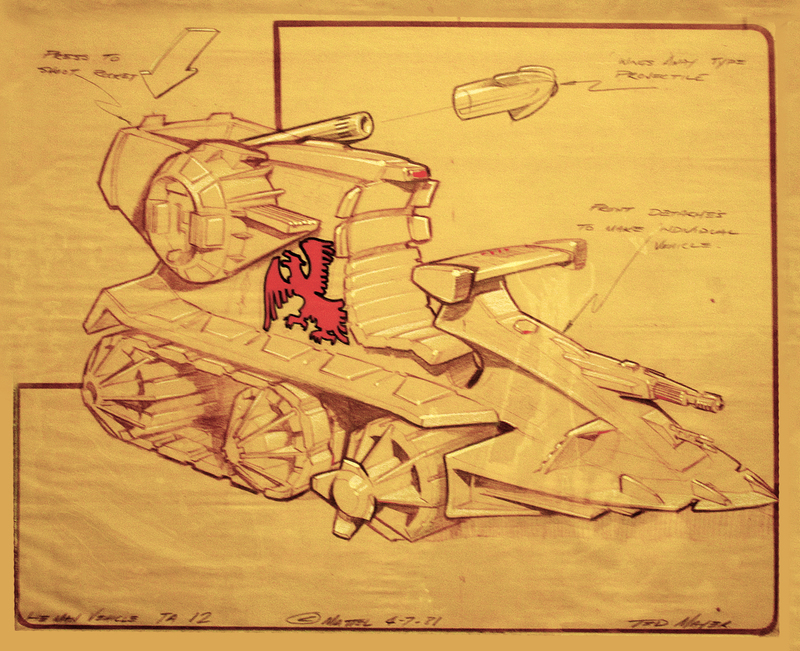 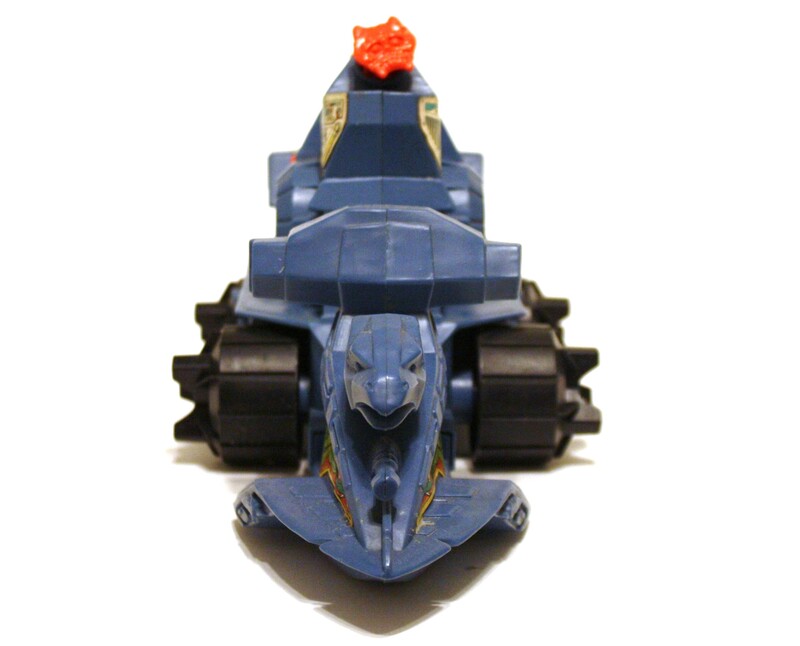 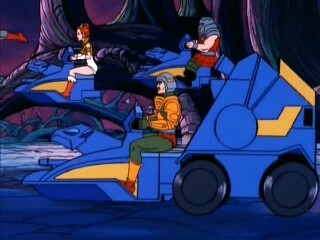 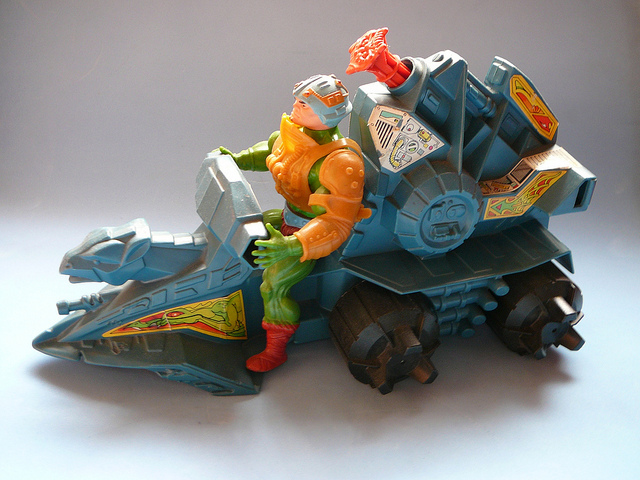 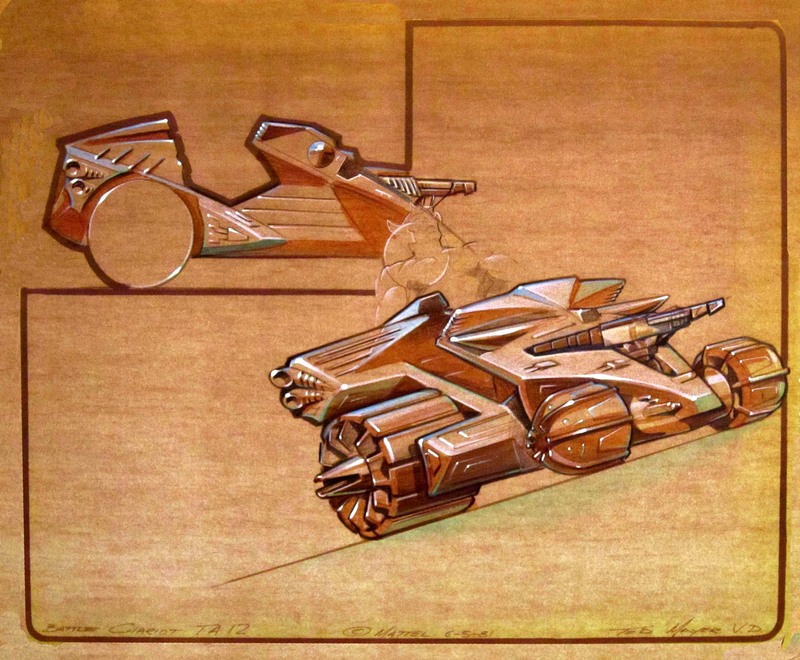 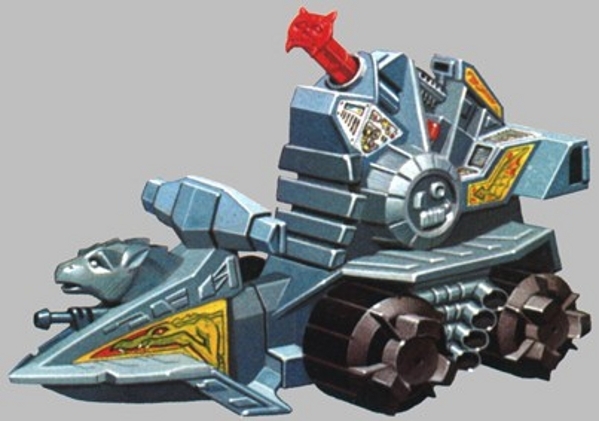 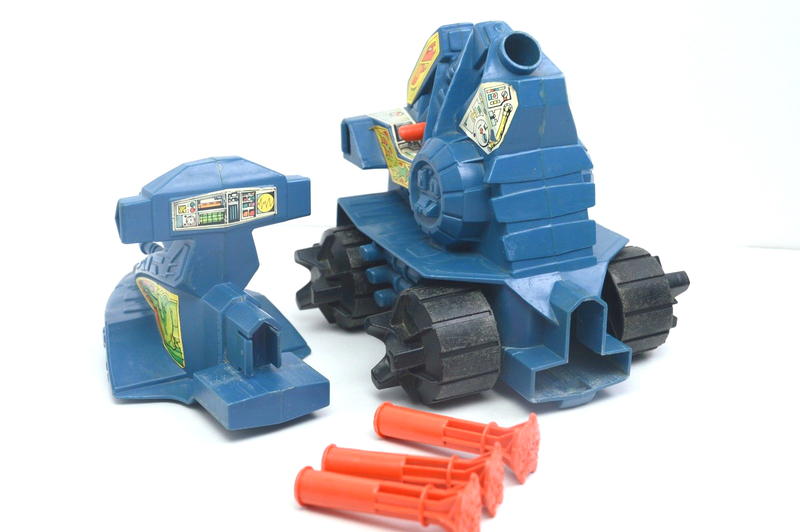 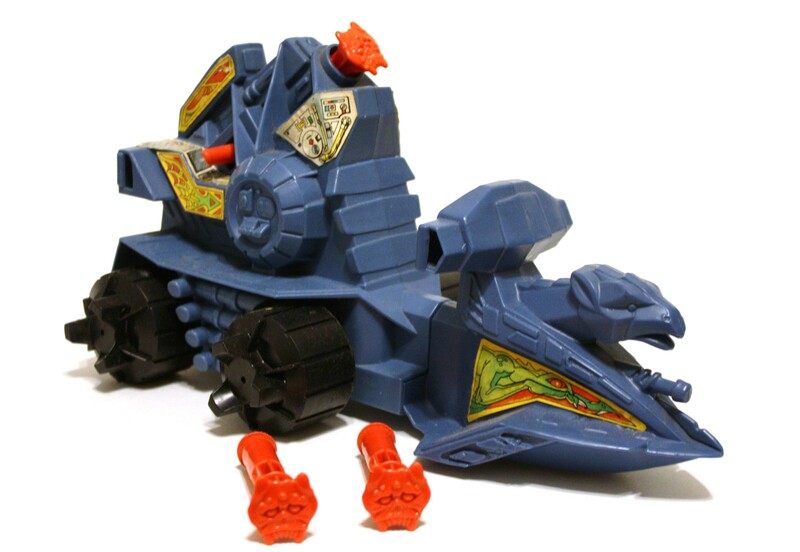 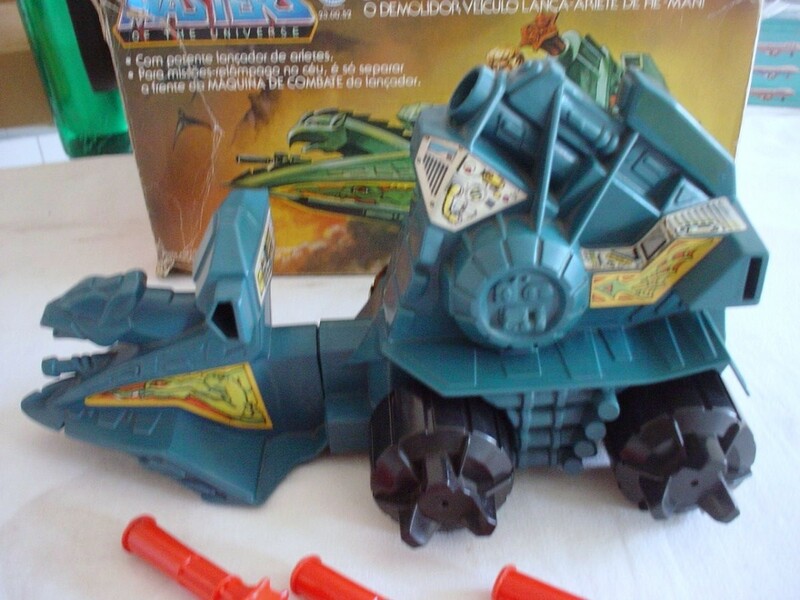 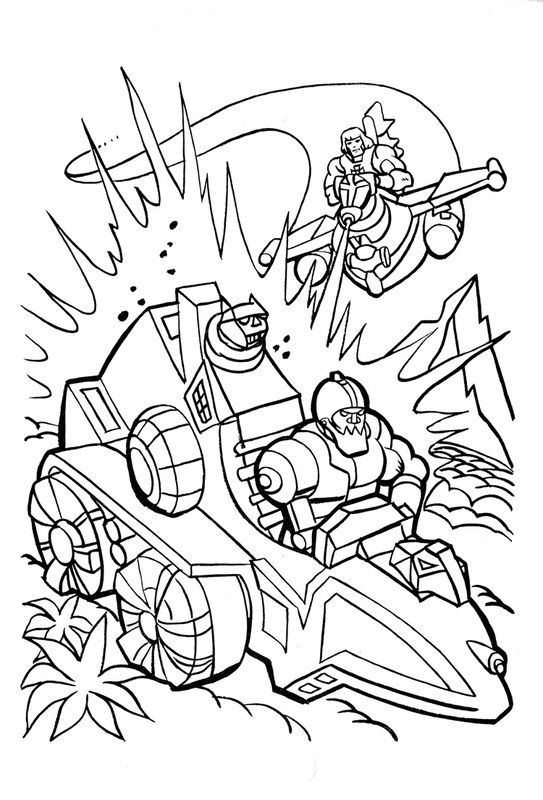 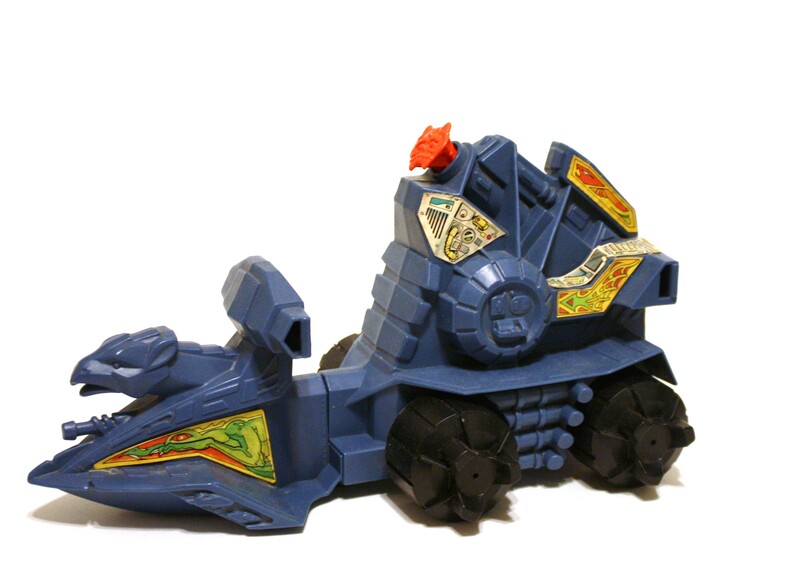 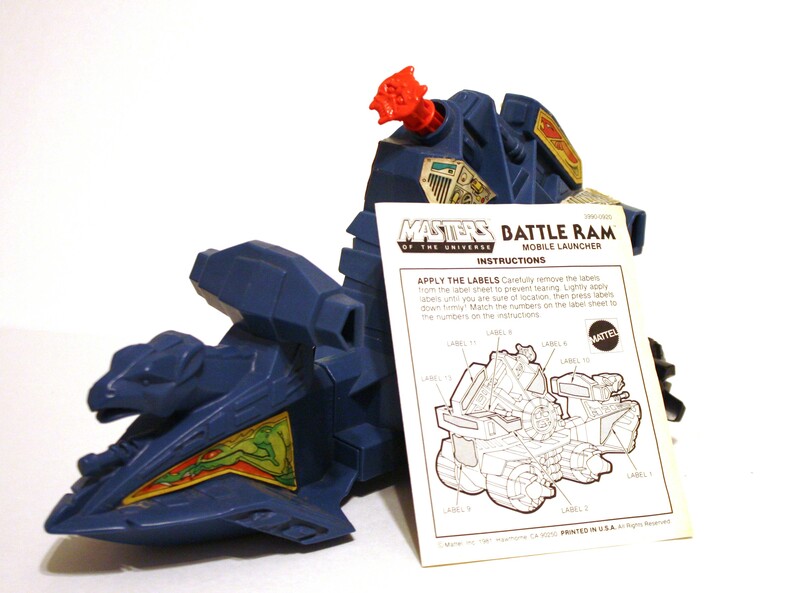 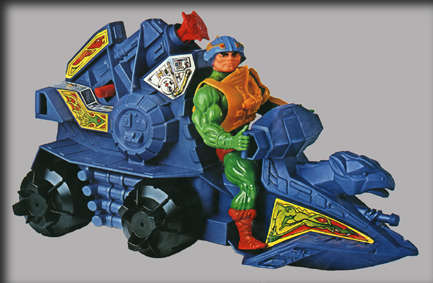 The Battle Ram constantly traded the title of “my favorite vehicle” with the Talon Fighter throughout my childhood. 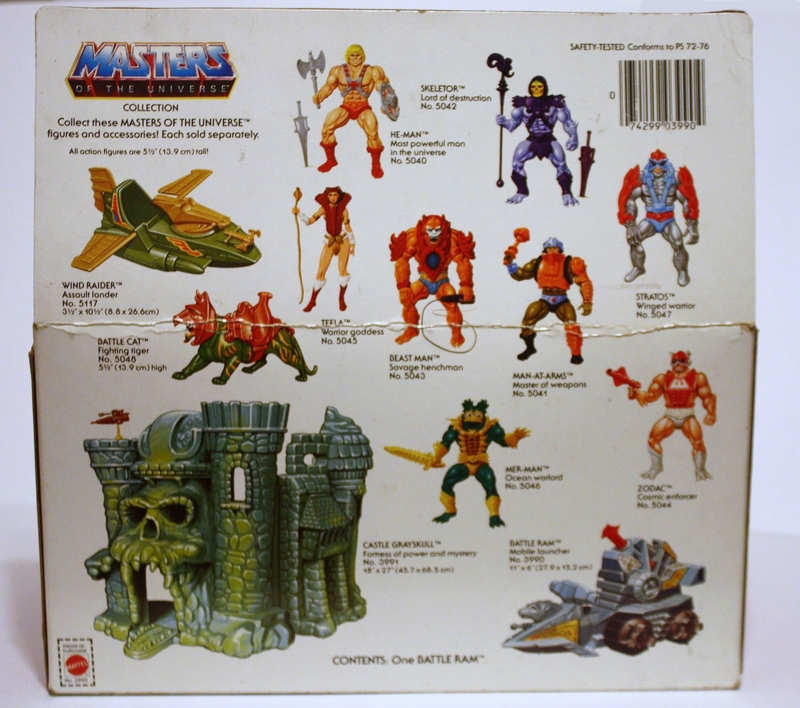 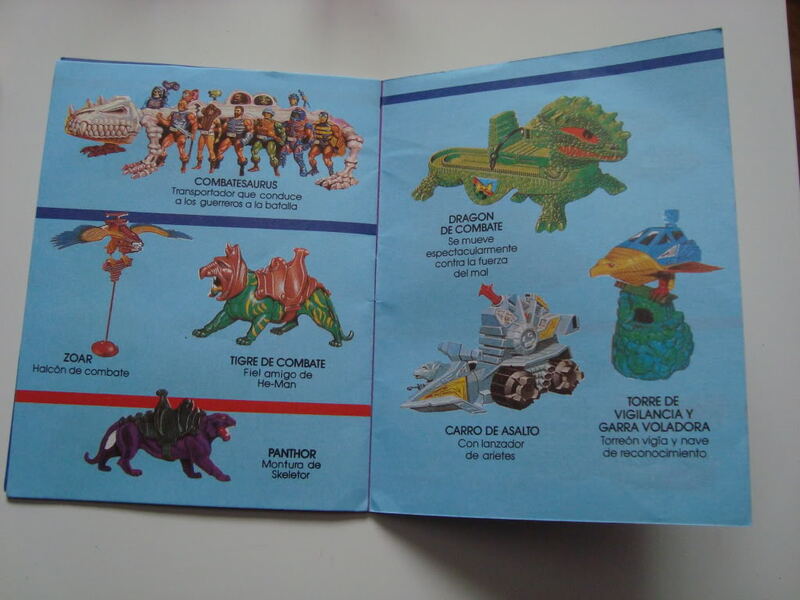 It was one of the first toys I ever got from the line. 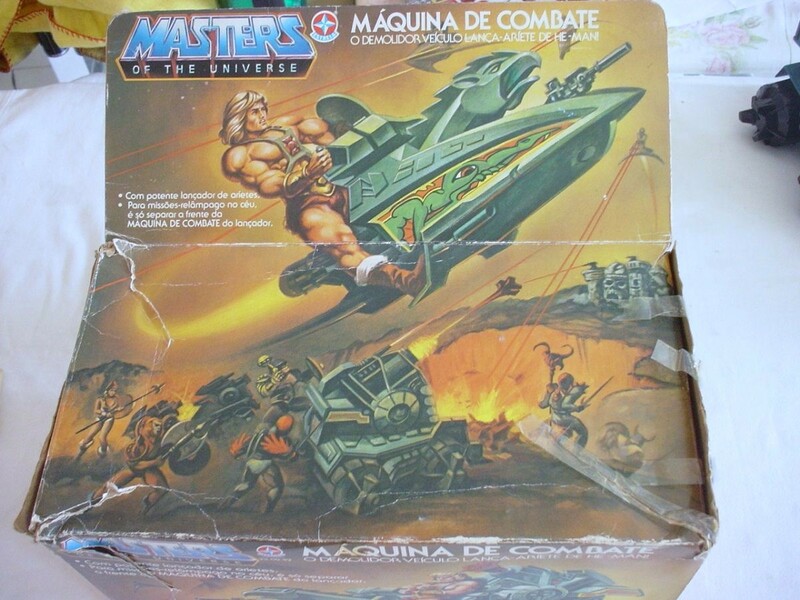 I remember my Mome confiscating the missiles for a couple of weeks after I fired one at my sister and it hit her in the face! 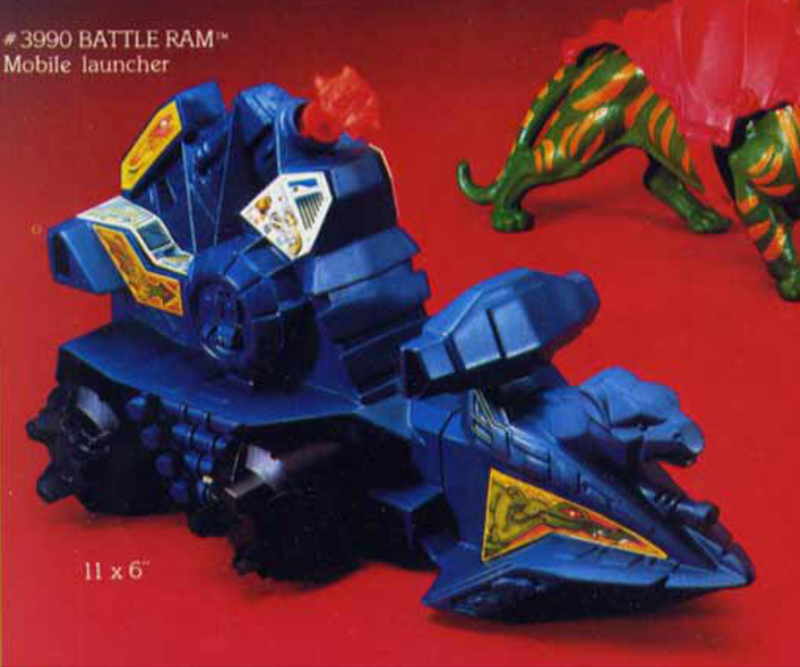 Those things could hit pretty hard at close range. 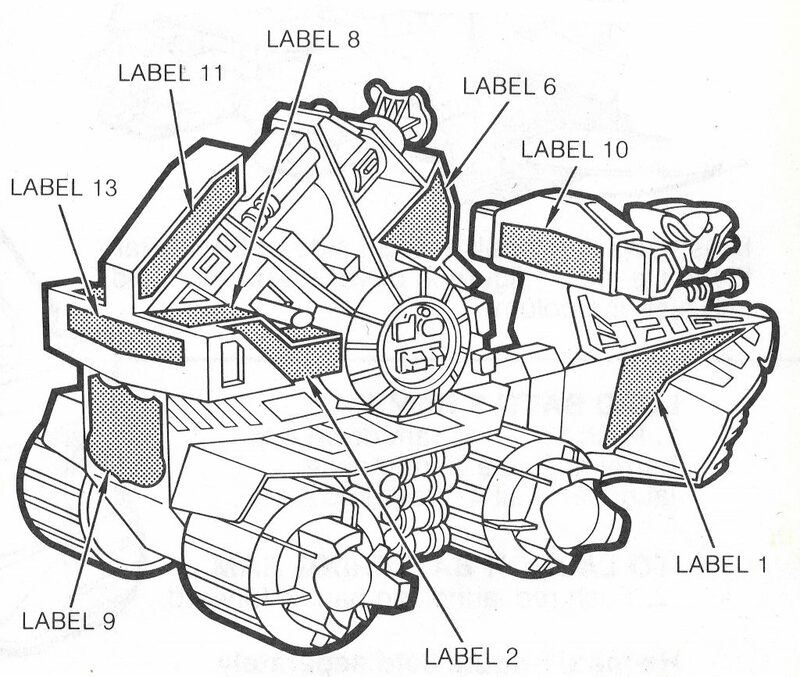 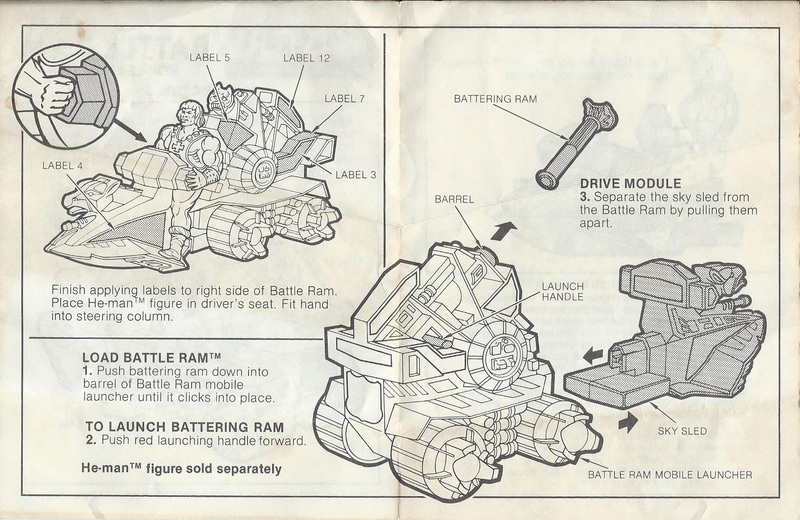 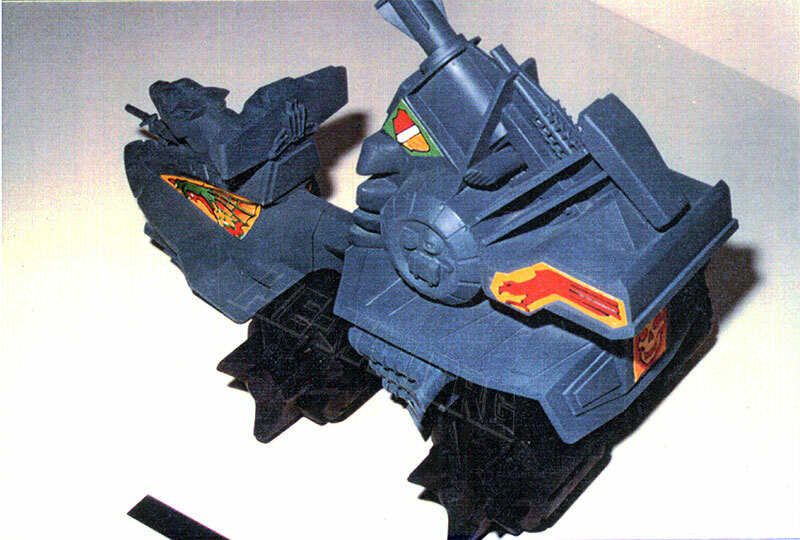 One of the things I loved about the Battle Ram was how many figures could have ride it; one on the sled portion, of course, one attached to one of the little handholds on the rear of the vehicle, and one could sit comfortably on the top, braced against the raised rear portion. 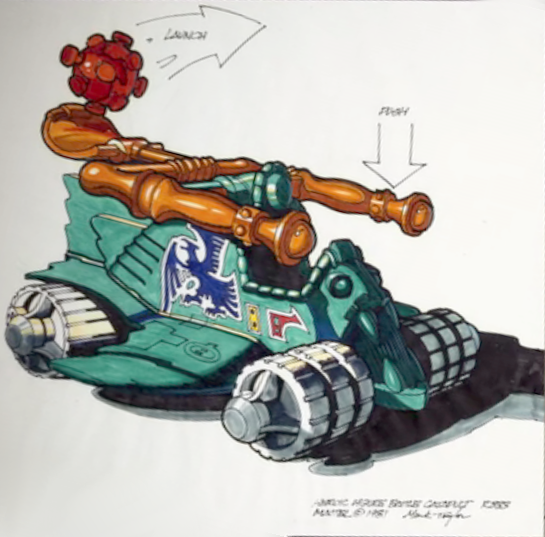 That, along with its size and detachable sled, gave it a real deluxe feeling to me, even among other large vehicles in the line. 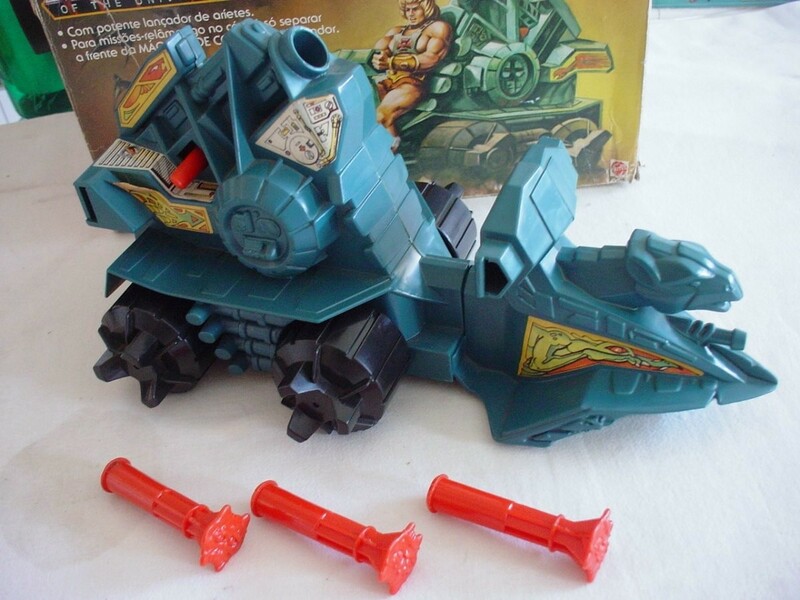 What surprise me even today is that this thing is virtually indestructible: during my playing, my BR traveled on floors, gardens, beaches, rammed at full speed through gravel barricades and in more than an occasion it went even underwater. 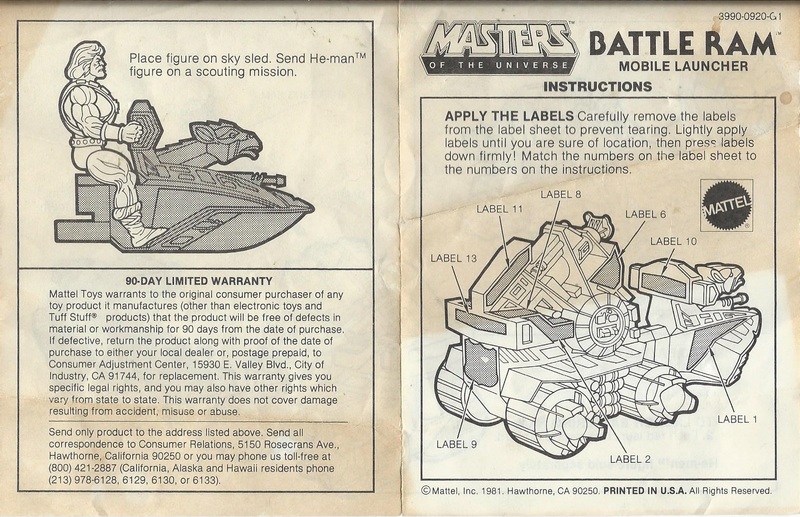 No damages and even the stickers are still perfectly on (just slightly worned out). 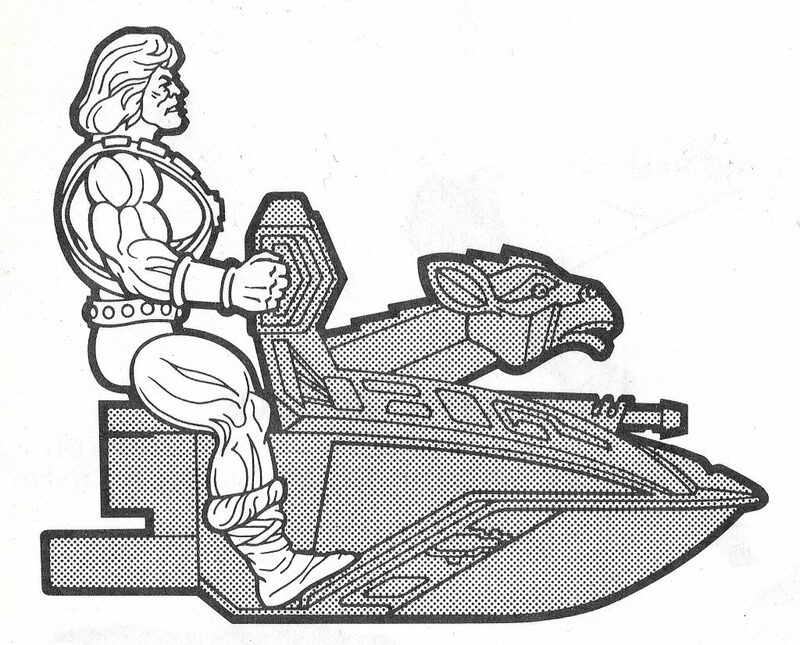 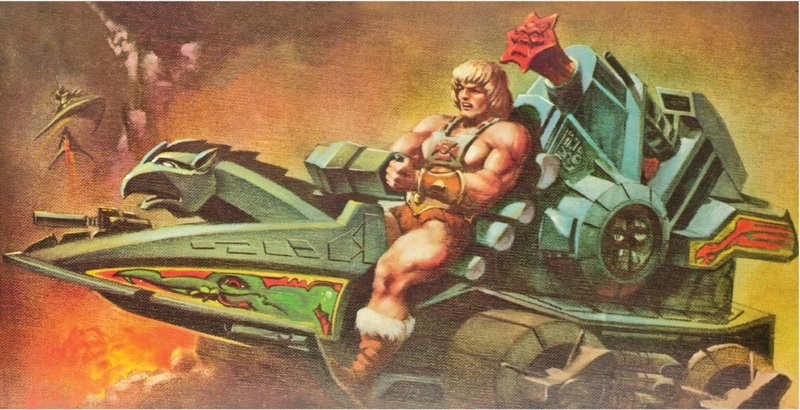 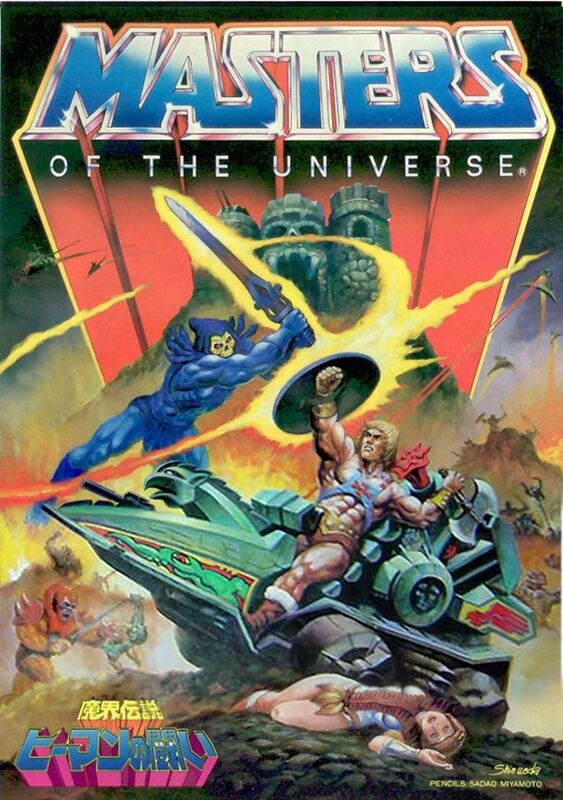 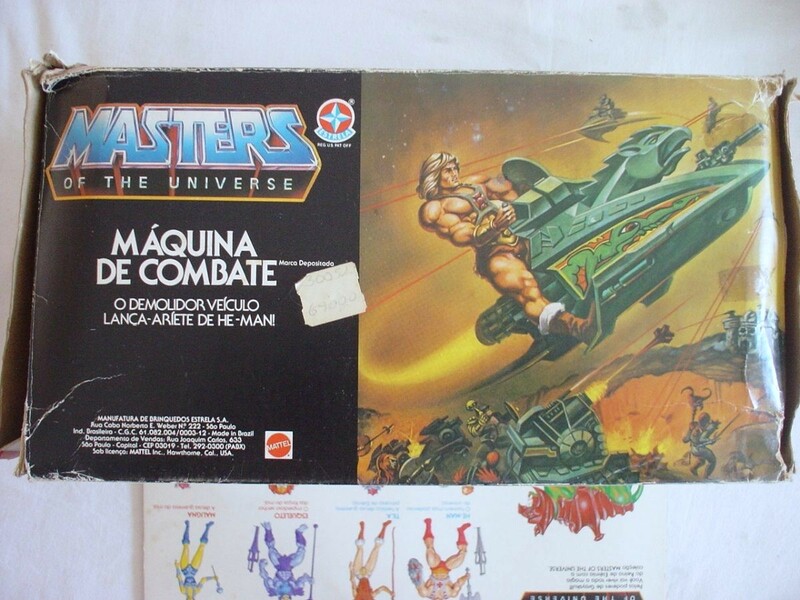 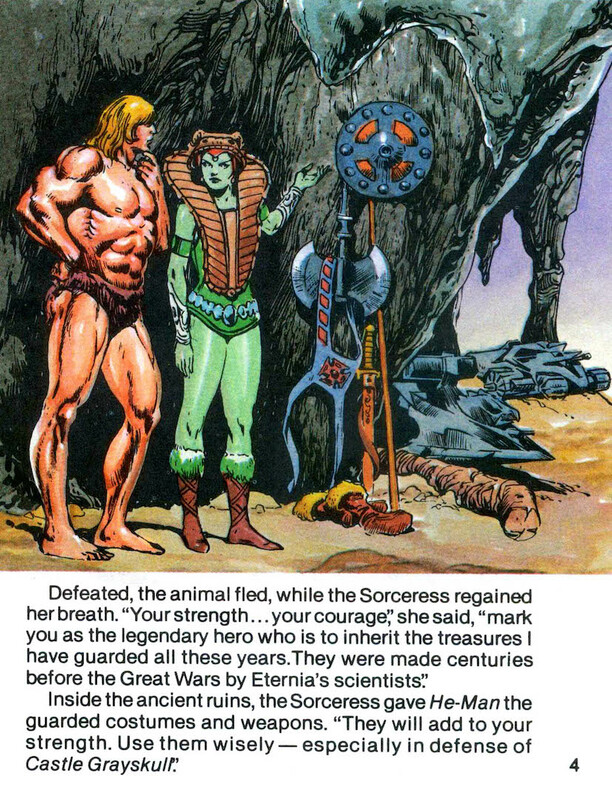 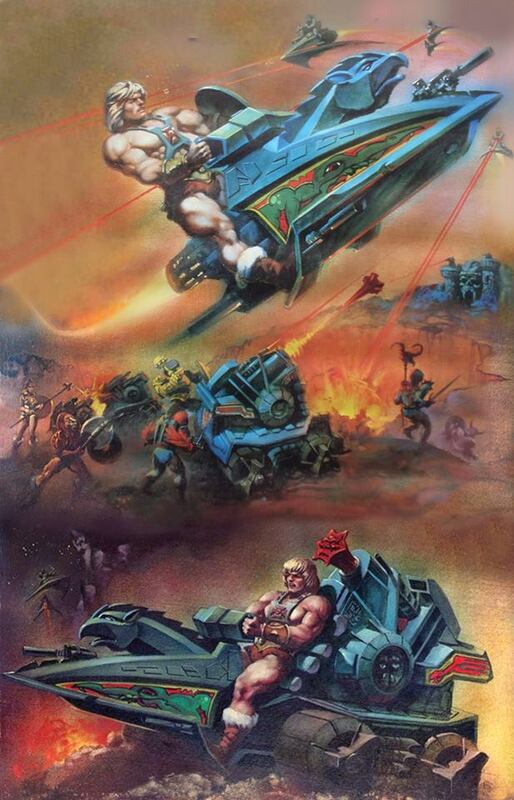 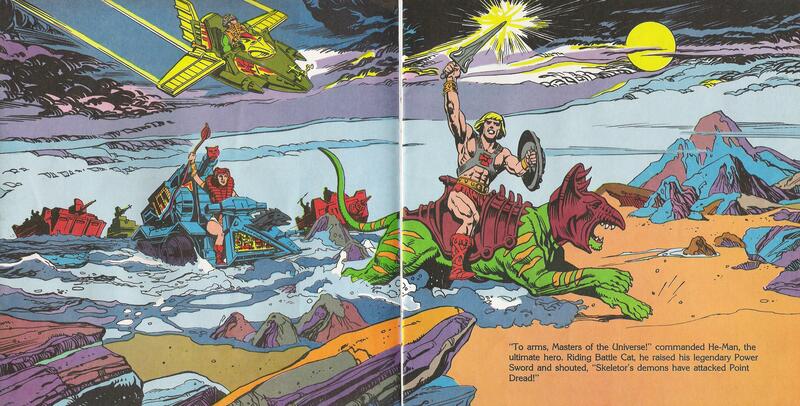 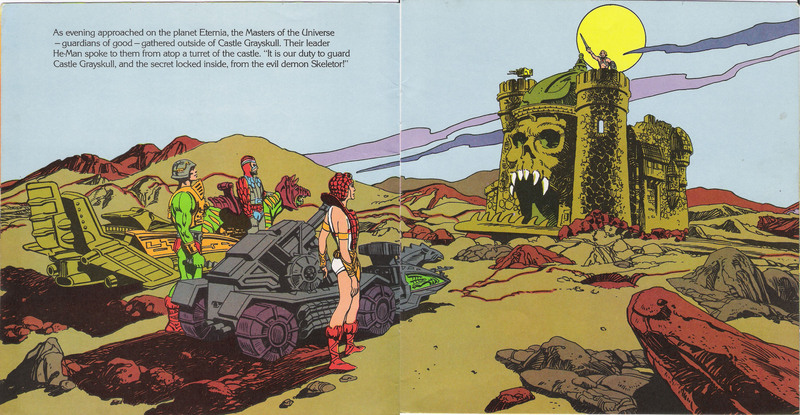 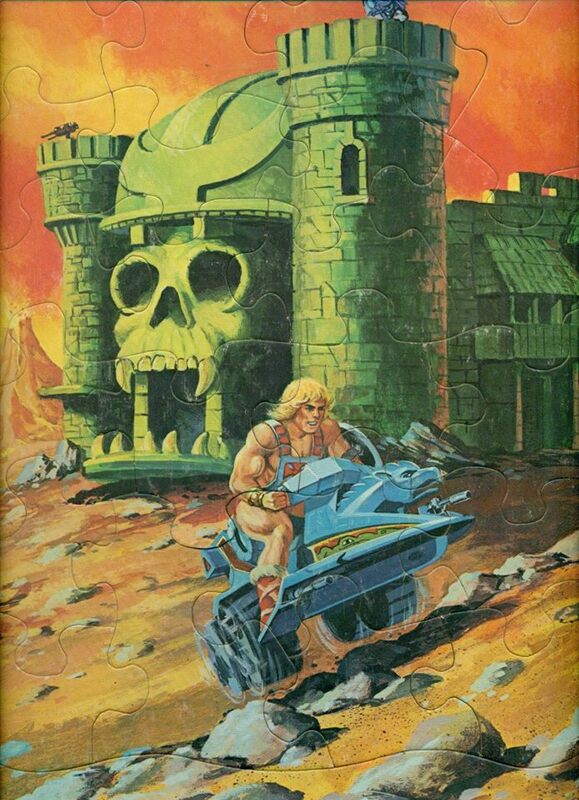 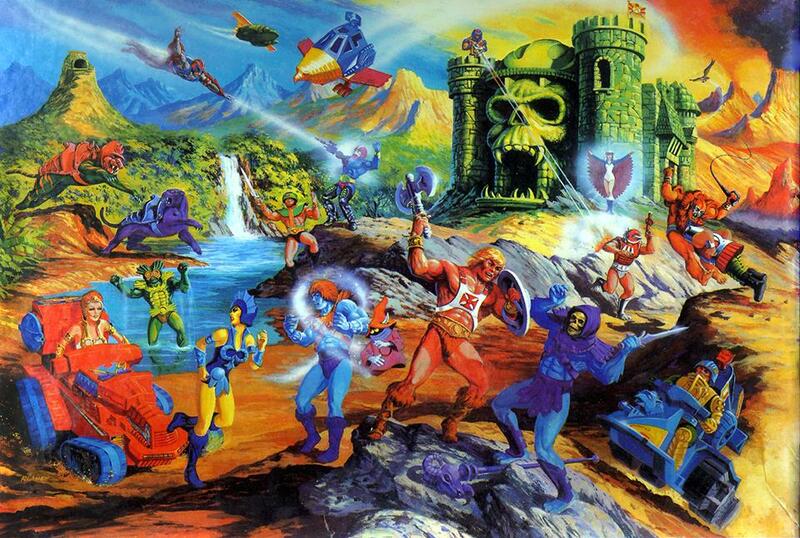 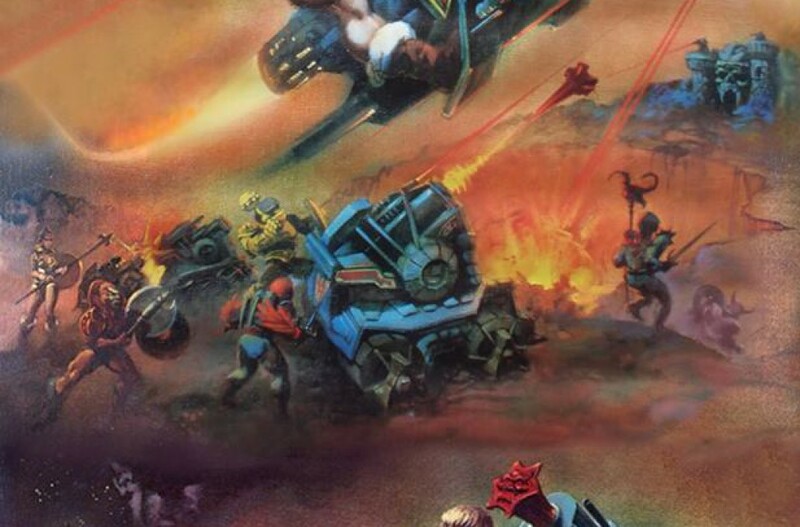 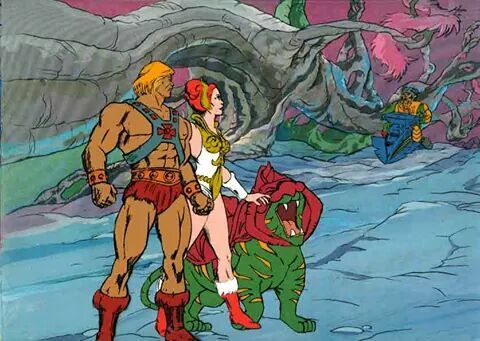 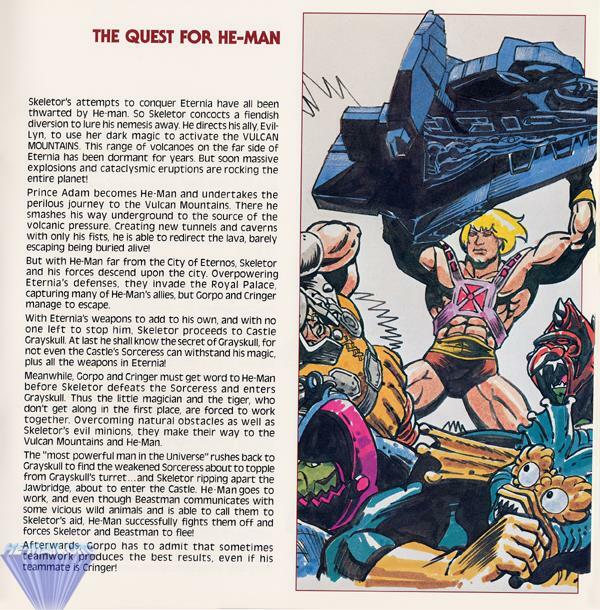 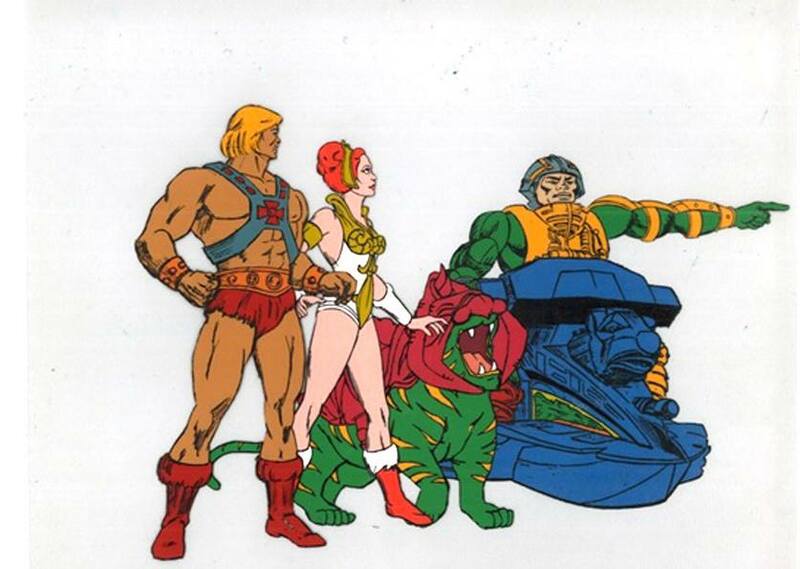 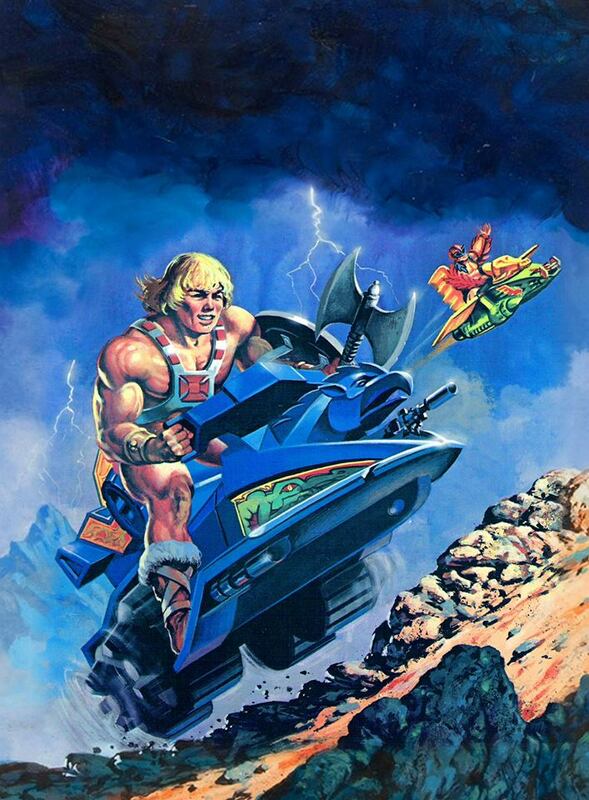 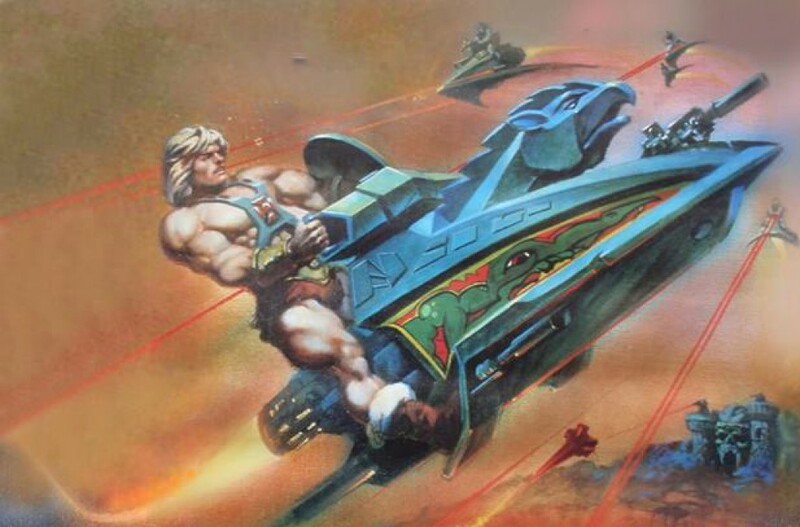 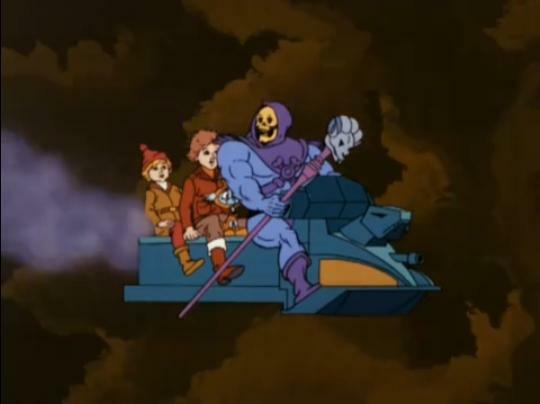 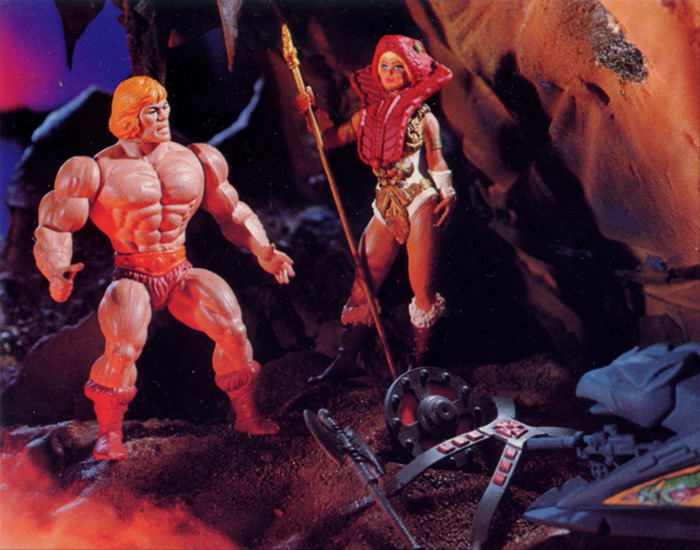 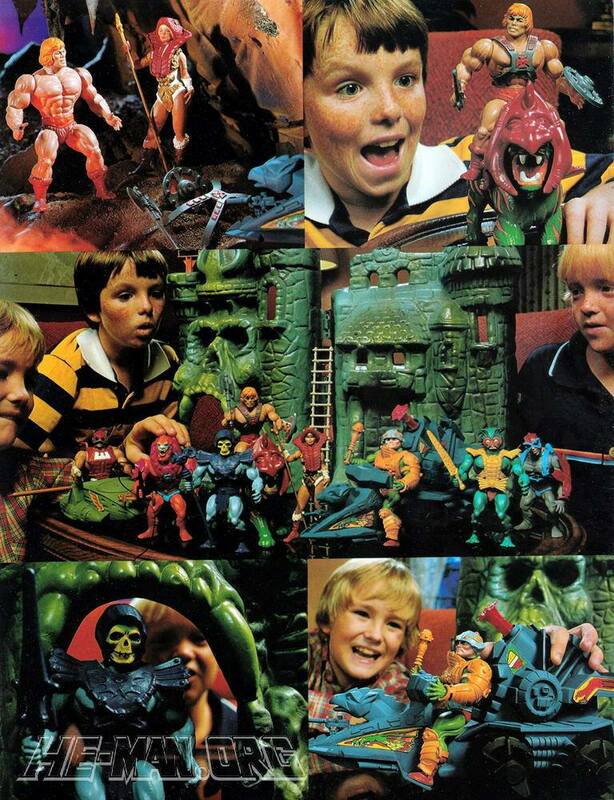 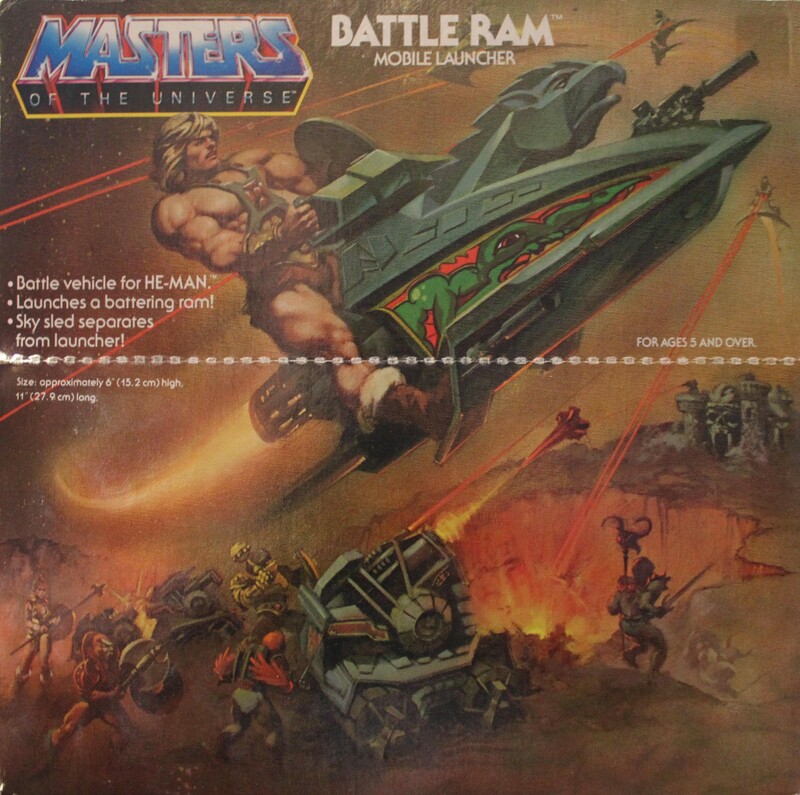 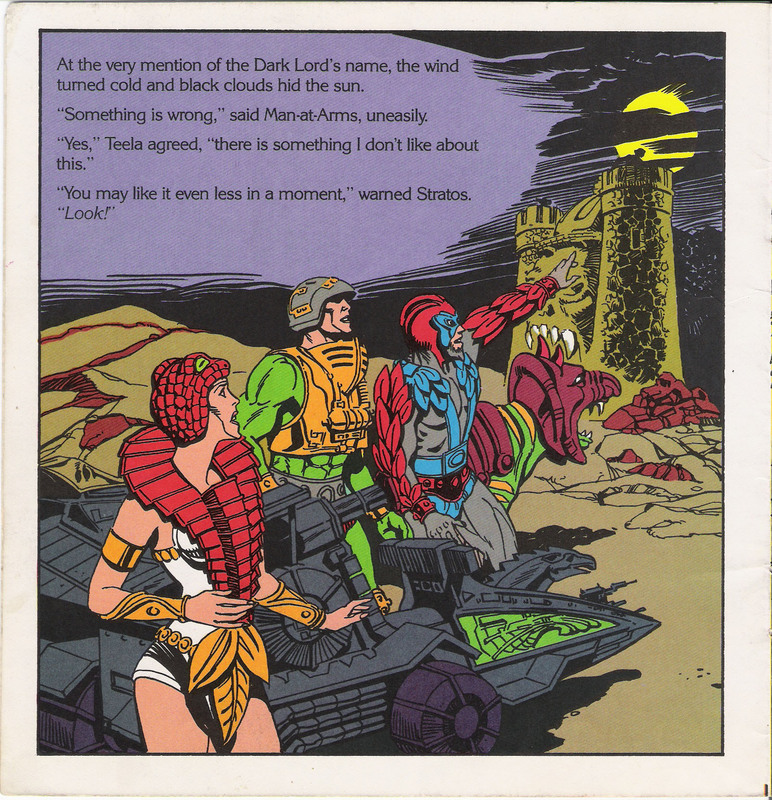 As well as ‘He-Man and the Power Sword’ and the 1984 UK annual indicating the front half of the Battle Ram (later known as the Sky Sled) hovers close above, another of the original four mini-comics, ‘The Vengeance of Skeletor’ also seems to suggest this – In the page picture we see He-Man (in silhouette) riding the front section just above the ground, as Beast Man and Mer-Man prepare to ambush him; The accompanying texts reading that it “…sped across the craggy terrain on a cushion of air”. 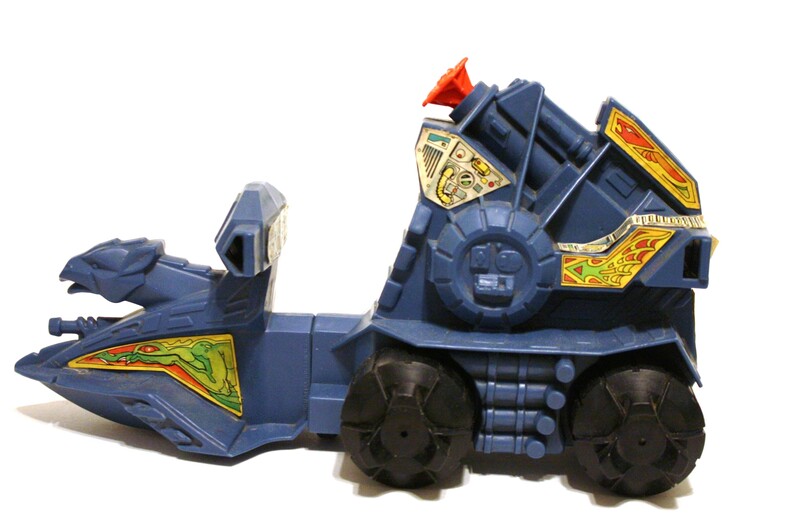 I often had a second figure riding on the back of the Battle Ram with their legs above the rear wheels and hands holding onto the holes at the back which are similar to the hand grips on the Sky Sled. 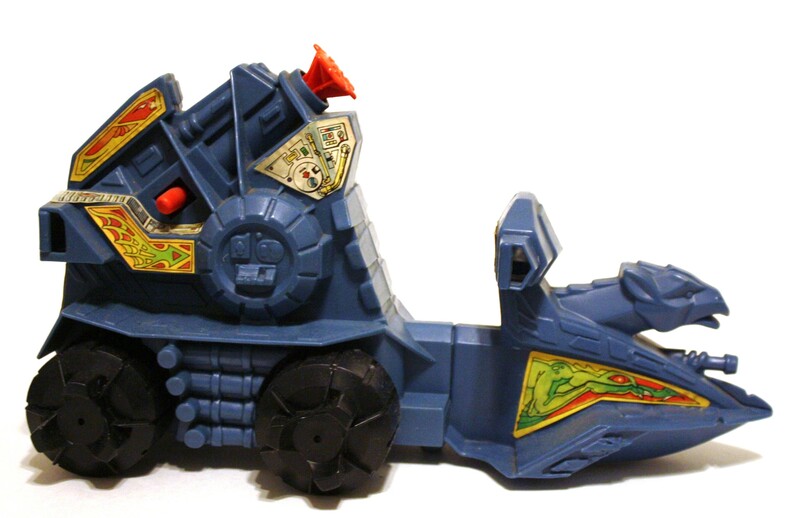 There is even a sticker with buttons/knobs on the back which makes me think this was intended as a place for a rider or second driver (when the Sky Sled is detached). 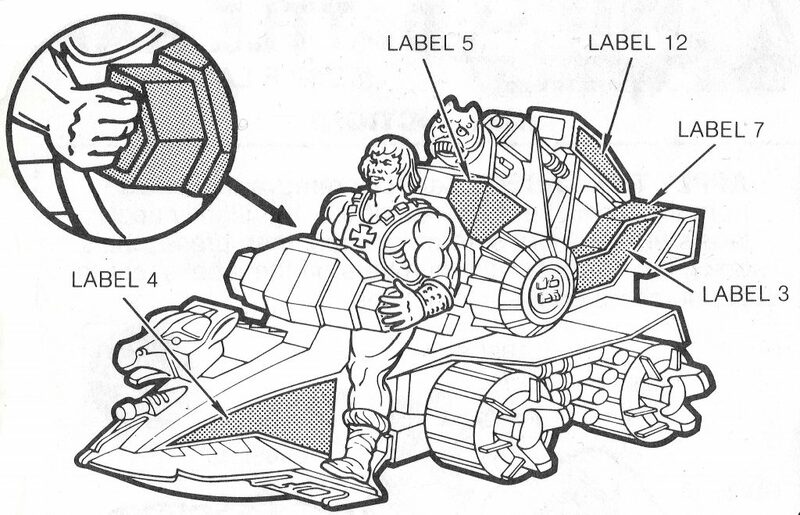 However, this functionality was not featured in any of the promotional material. 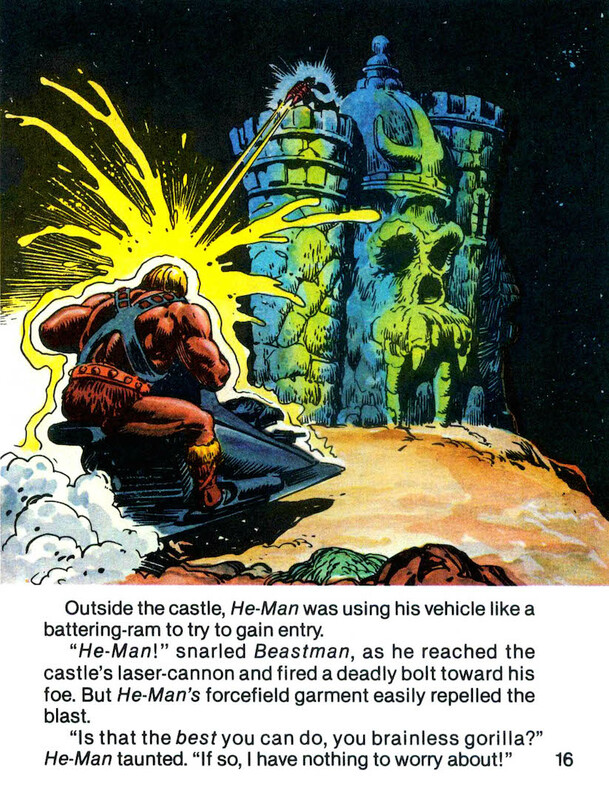 I remember trying to do that as well. 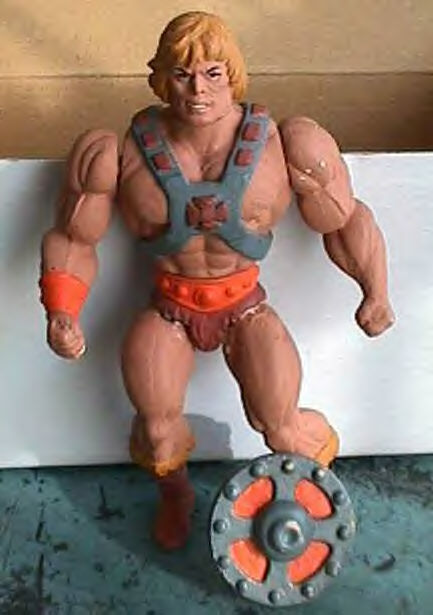 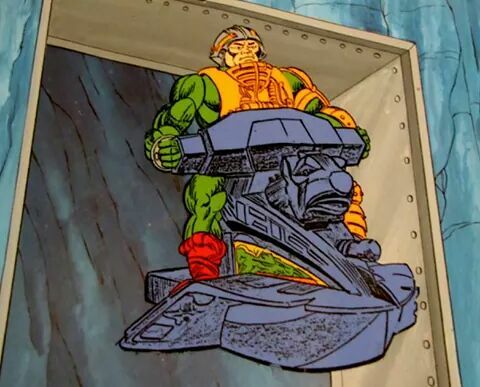 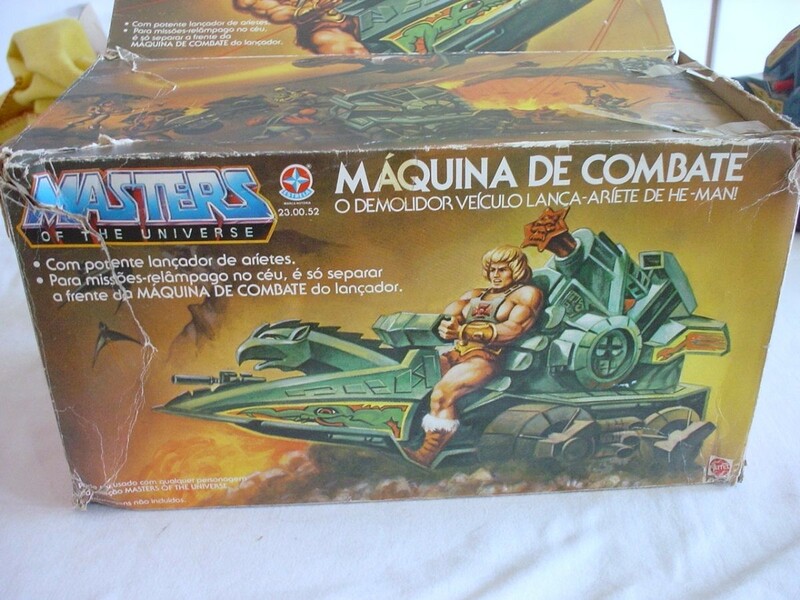 It does have handles in the back, but they seem to be just a tad too wide for even He-Man to hold. 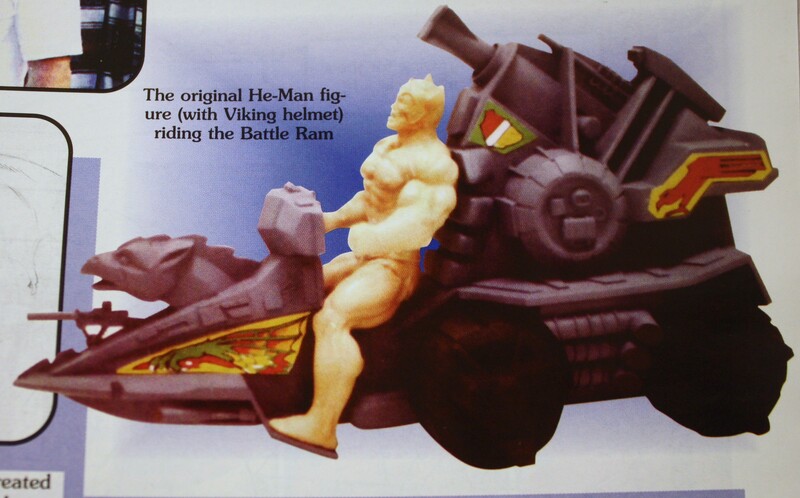 It does ride a figure pretty well sitting at the very back.